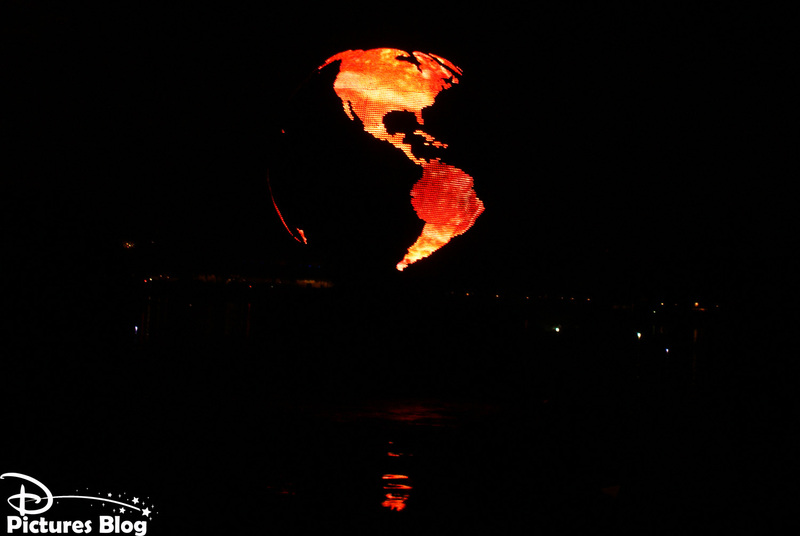 Le Chaos : le big bang, l'apparition de la Terre, puis l'Ordre : la création des éléments, des peuples, de l'humanité, de l'histoire, et enfin la Signification : aller de l'avant, continuer à écrire l'histoire... C'est autour de cette histoire, notre histoire, que chaque soir depuis 1999 les visiteurs se rassemblent autour du World Showcase Lagoon en plein coeur d'Epcot pour assister à IllumiNations : Reflections Of Earth. 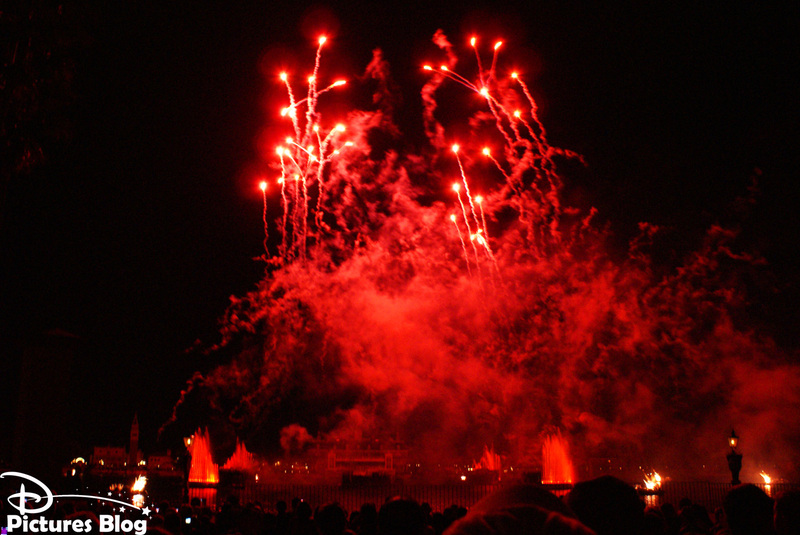 C'est un spectacle multimédia faisant intervenir de la vidéo, de la pyrotechnie, des fontaines, des lasers et une merveilleuse musique pour donner vie à l'histoire de l'humanité et transmettre le message d'Epcot. 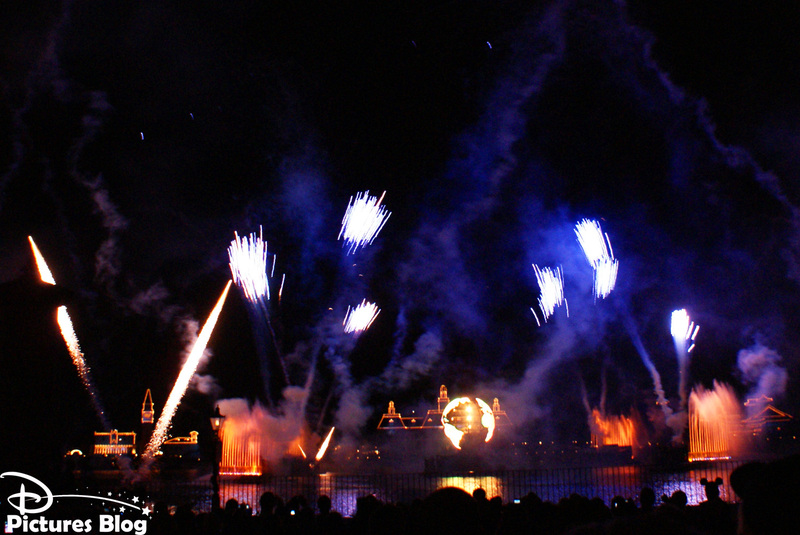 C'est le spectacle le plus impressionnant et le plus adulte présenté à Walt Disney World ! 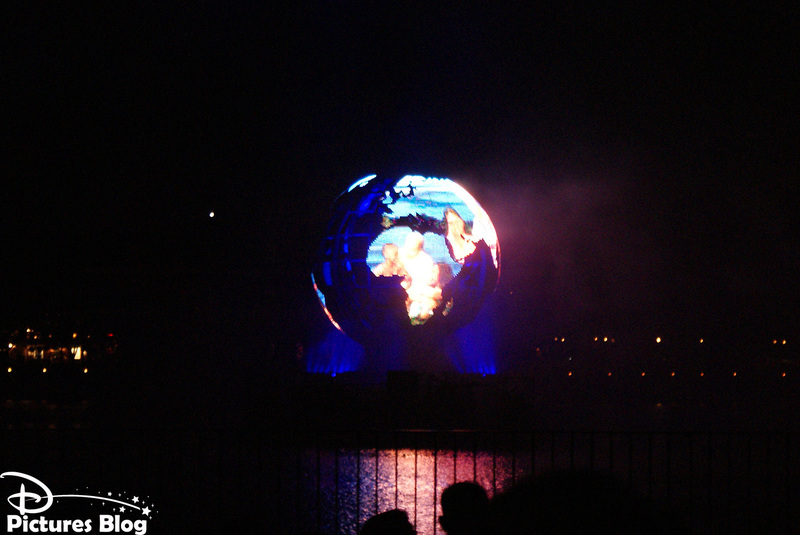 The Chaos, when planet Earth appeared, then Order : the appearance of the elements, the people, humanity, history, and finally the Signification : going on, making history... 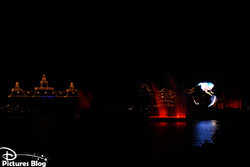 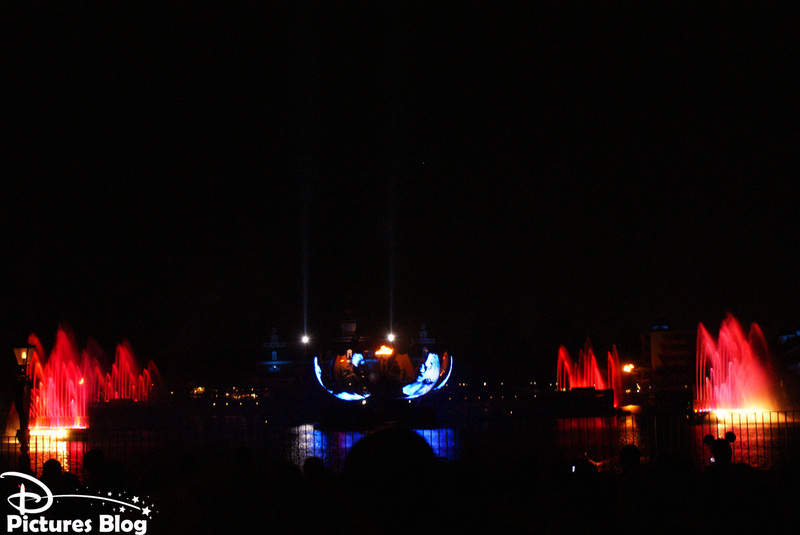 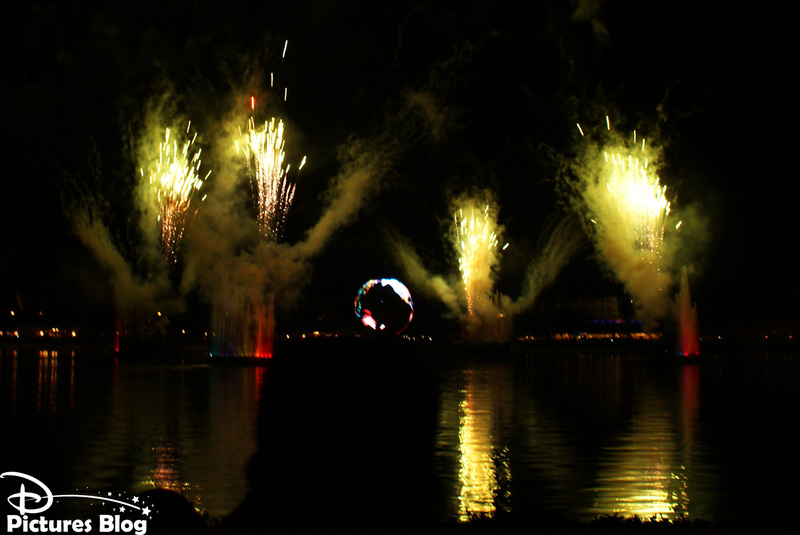 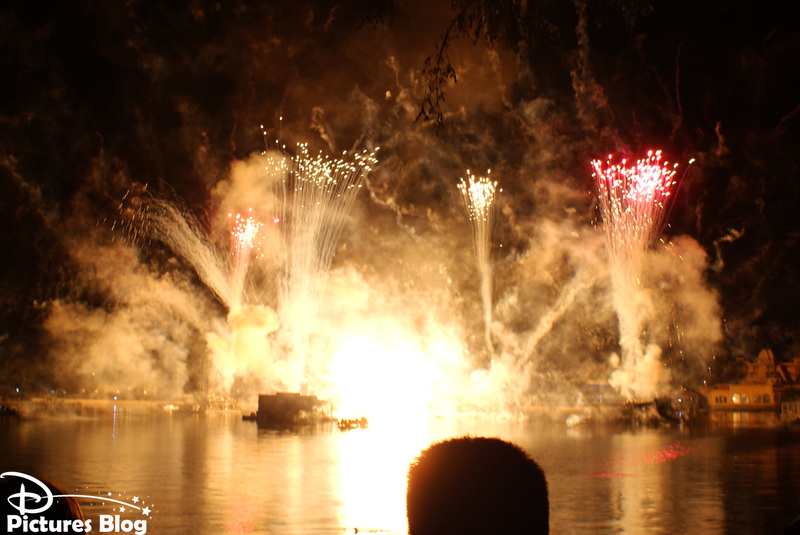 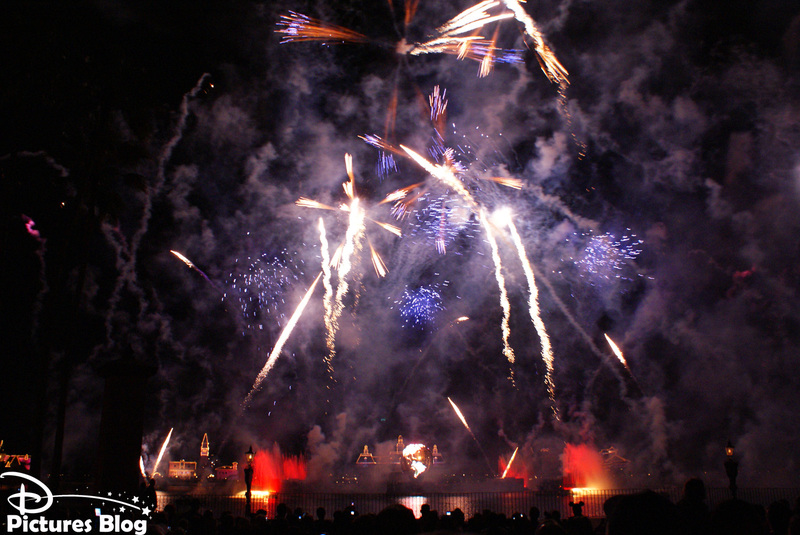 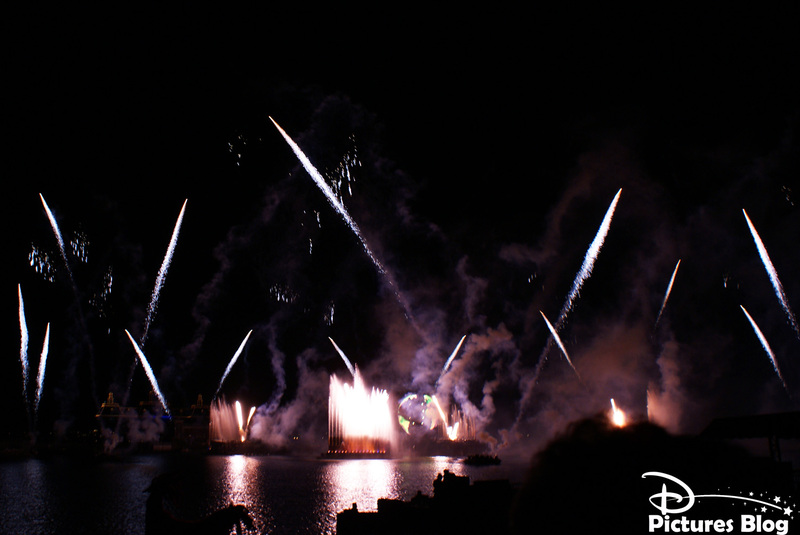 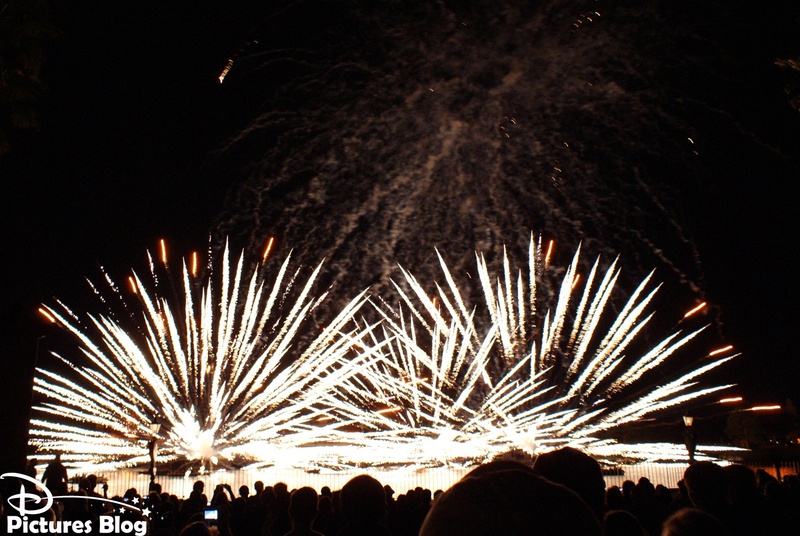 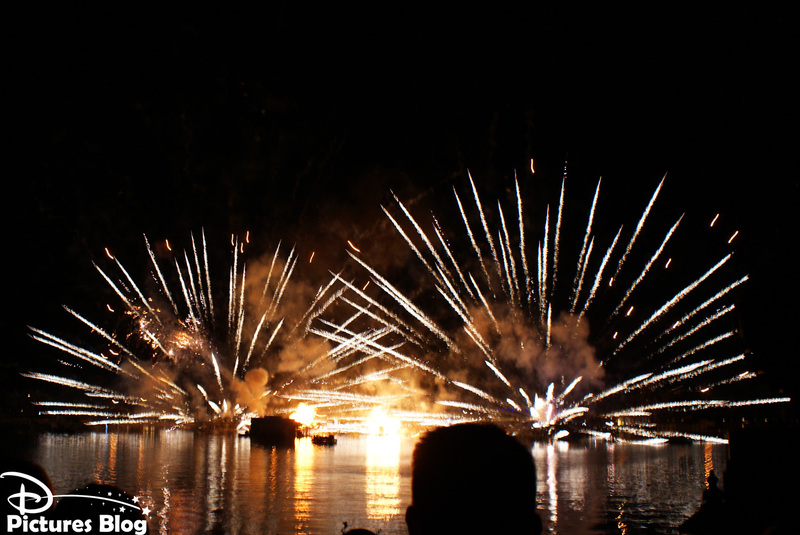 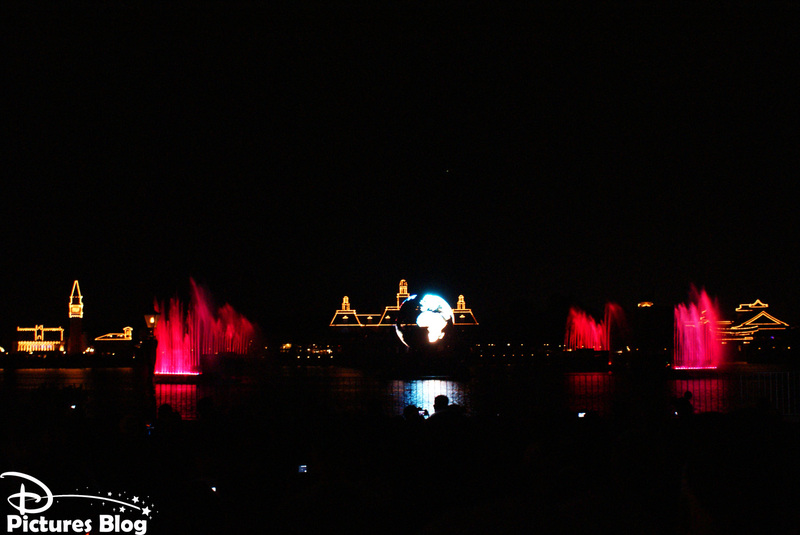 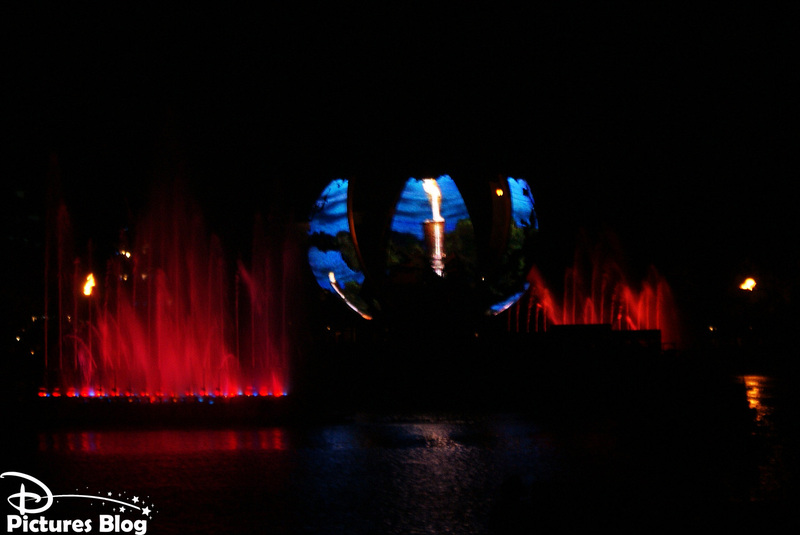 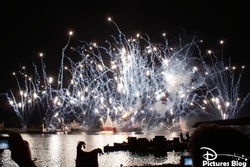 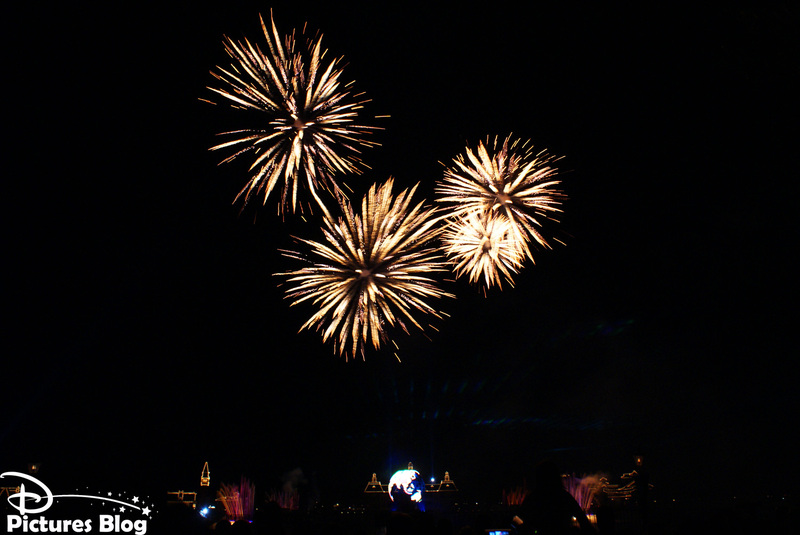 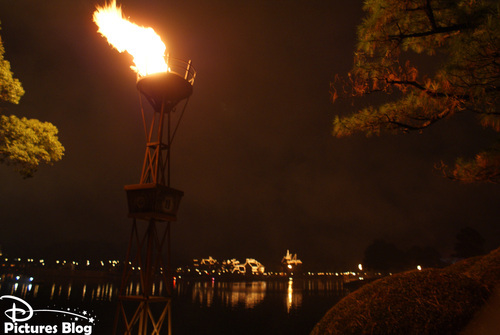 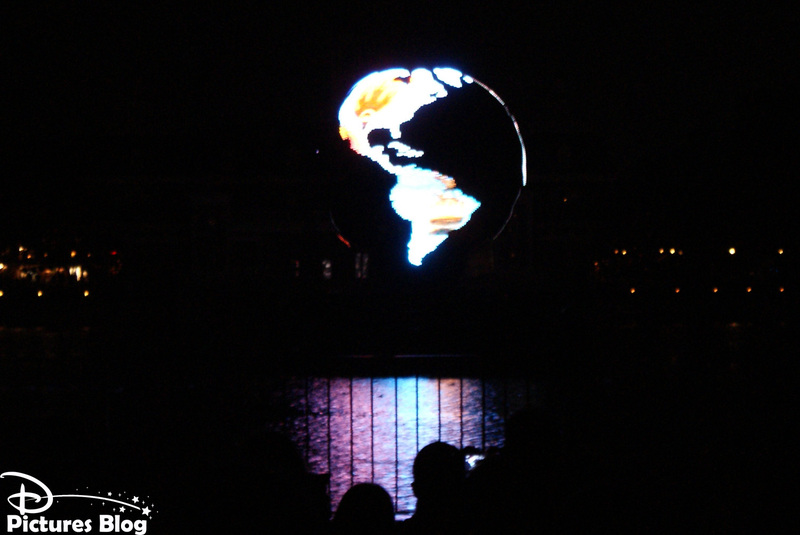 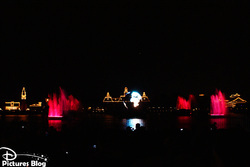 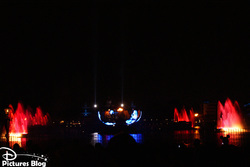 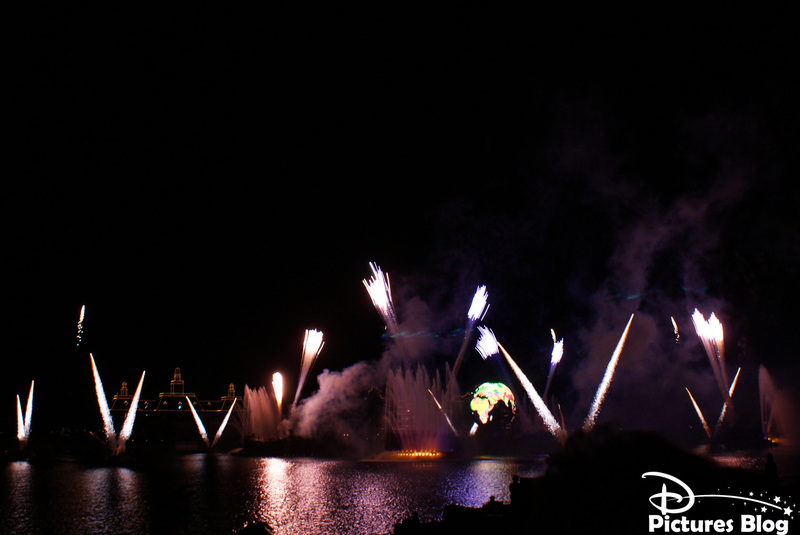 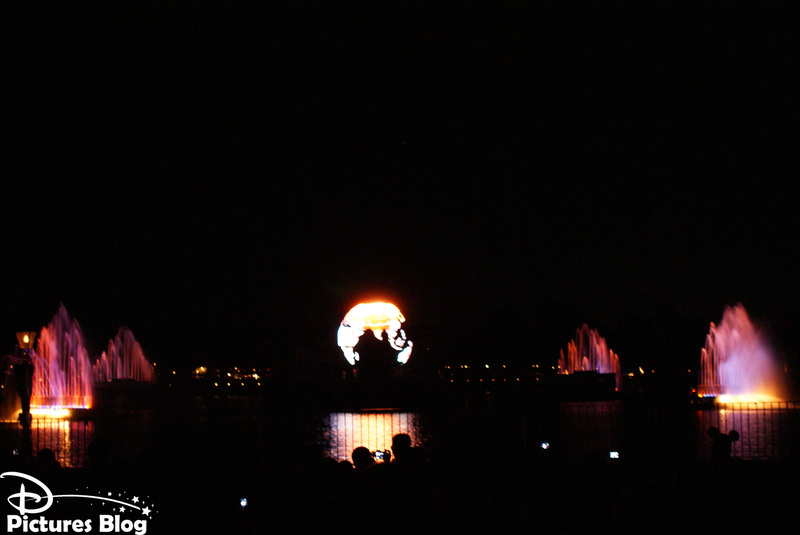 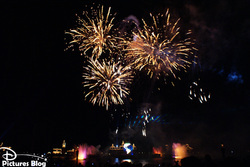 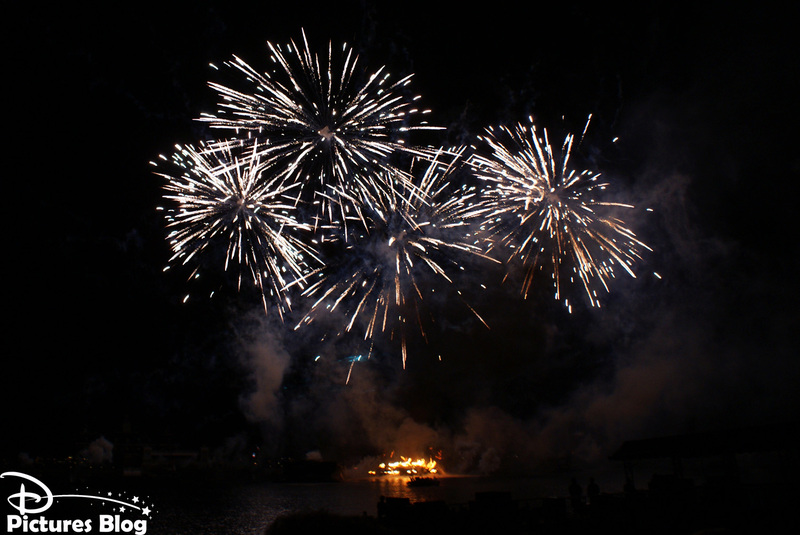 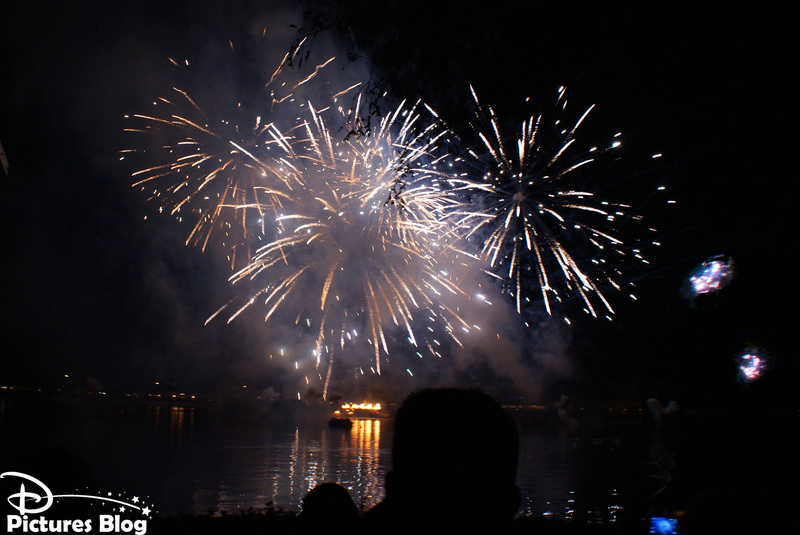 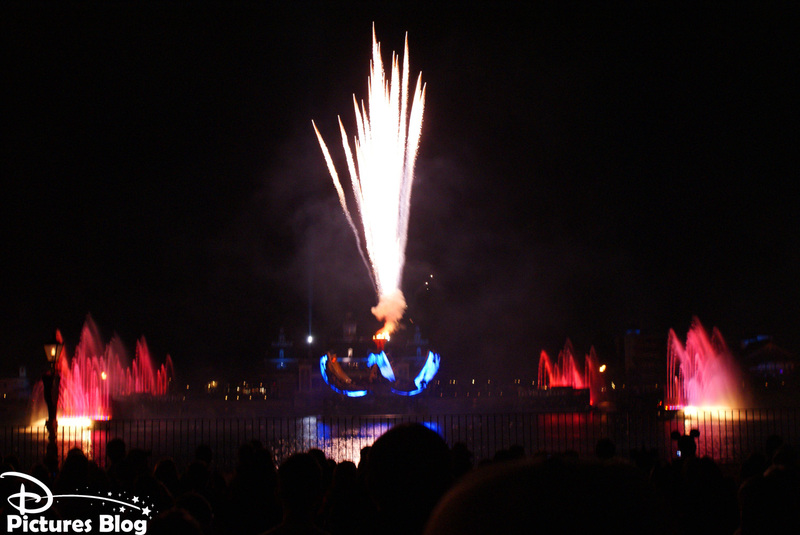 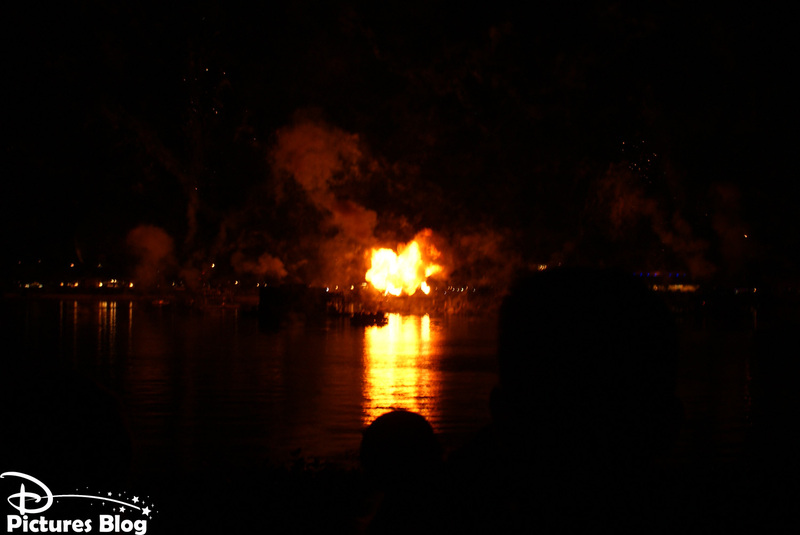 This is a way of summing up the story - our story - that is told each night since 1999 to all Epcot guests as IllumiNations : Reflections Of Earth lights up the World Showcase Lagoon. 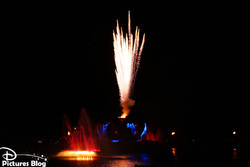 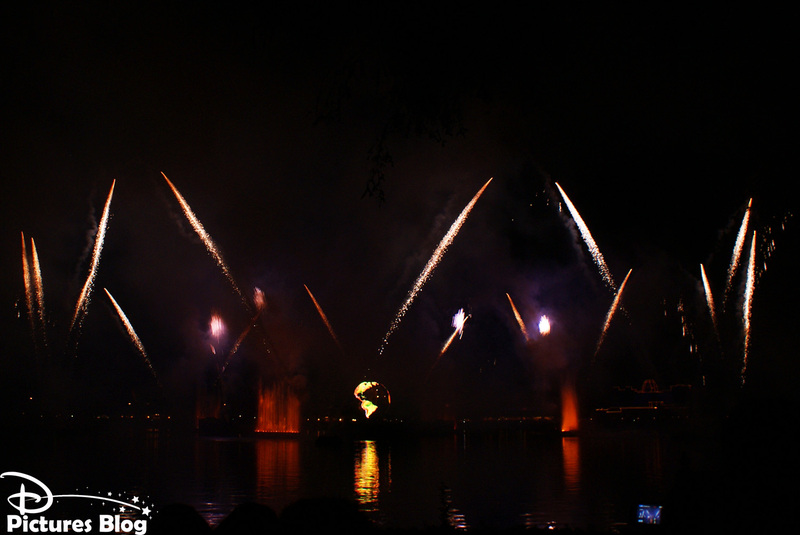 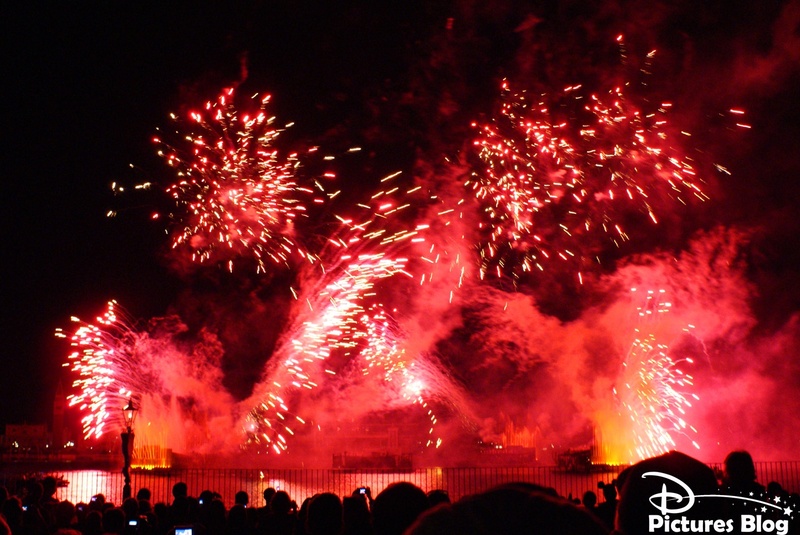 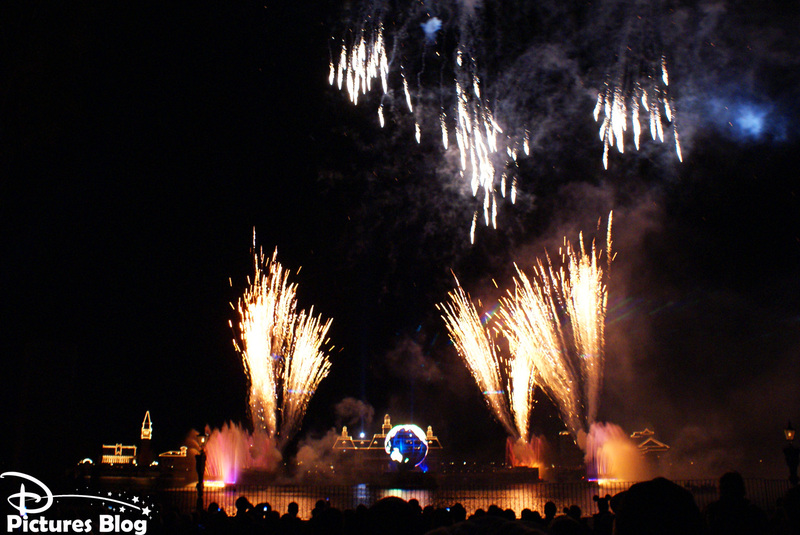 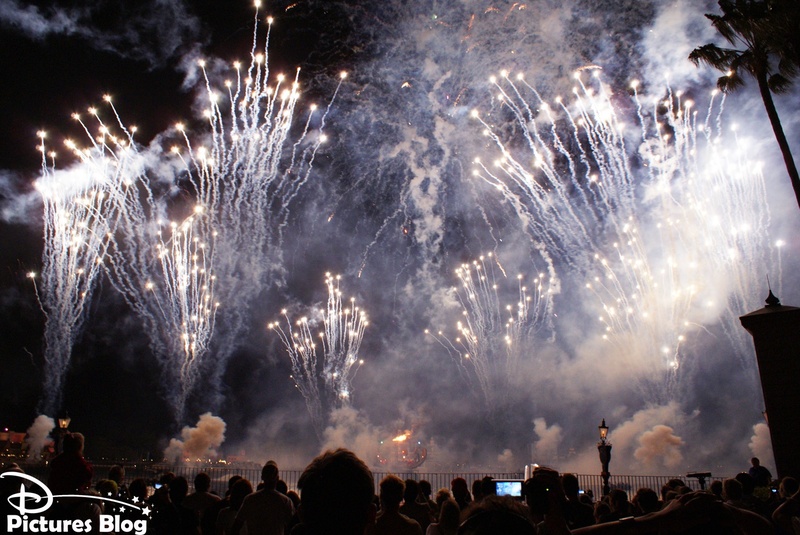 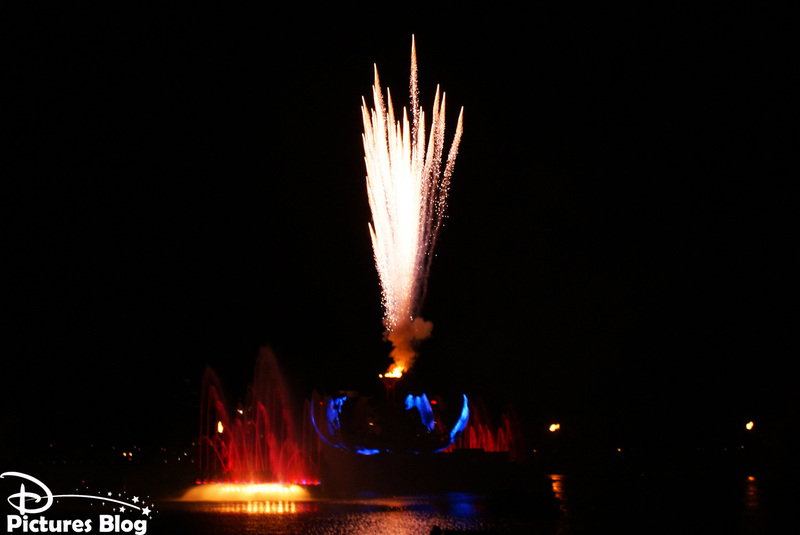 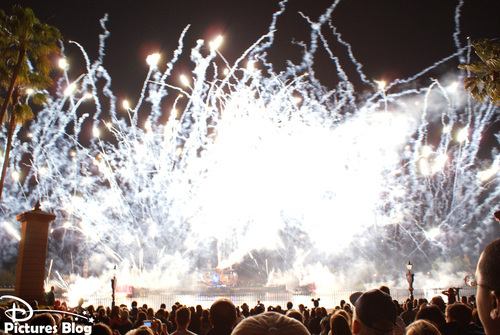 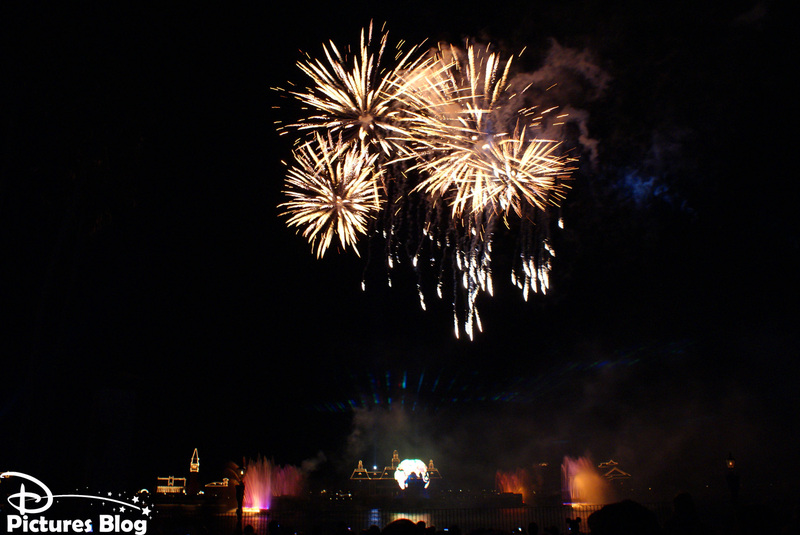 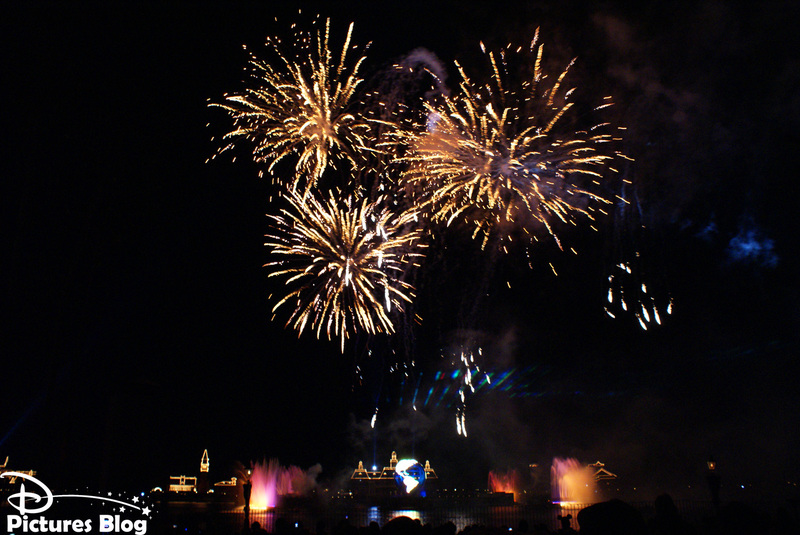 IllumiNations is a multimedia show, using video, pyrotechnics, fountains, lasers and a wonderful musical score to bring humanity history to life and tell Epcot's message and values. 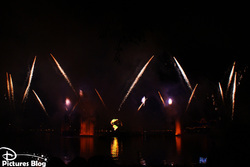 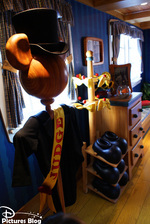 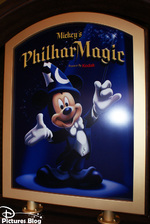 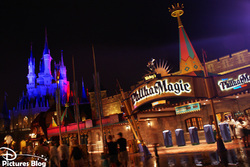 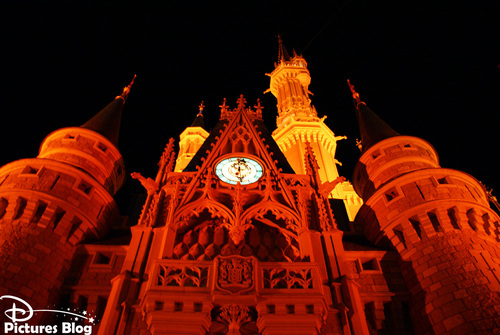 This is the most spectacular and mature show presented at Walt Disney World ! 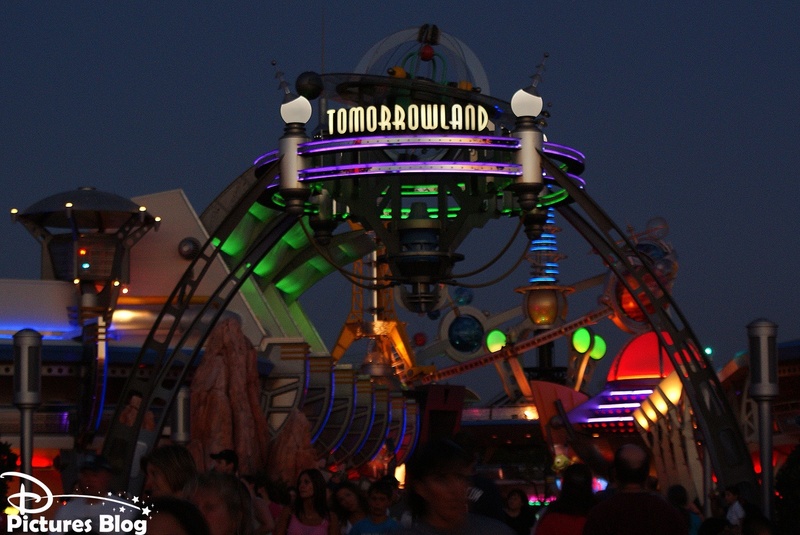 Tomorrowland est un endroit délicieusement rétro-futuriste qui correspond à l'image des années 2000 que l'on avait dans les années 70. 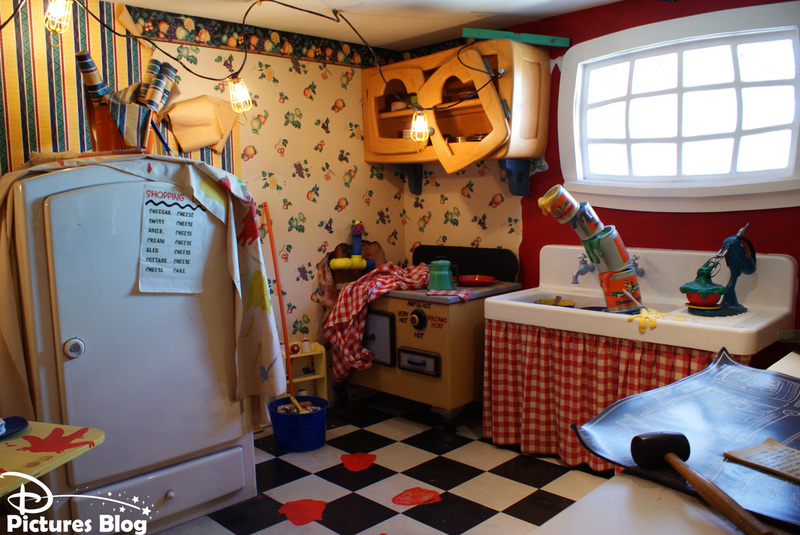 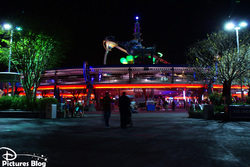 Les batiments sont arrondis, métalliques, évoquent l'espace et les voyages, et abritent des attractions familières comme Tomorrowland Speedway (le Autopia local), Astro-Orbiter, Buzz Lightyear's Space Ranger Spin ou Space Mountain. 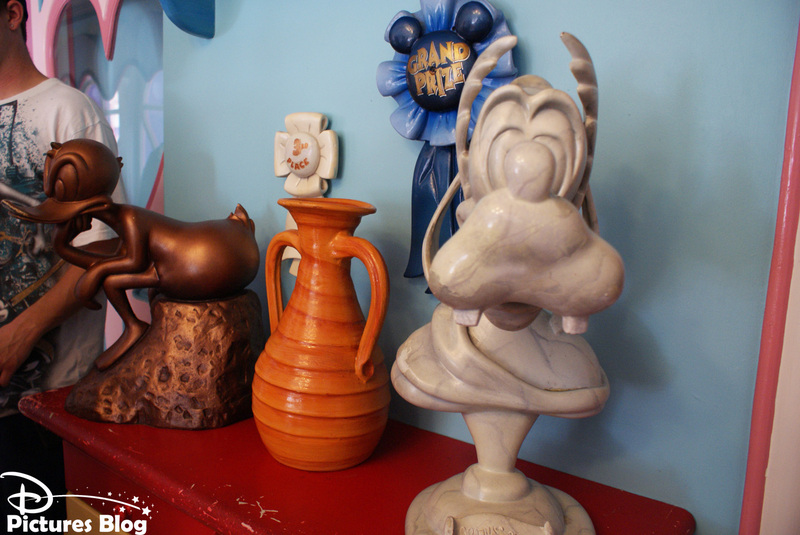 On y trouve aussi de véritables pièces de musées : Walt Disney's Carroussel of Progress et Tomorrowland Transit Authority, toutes deux importées de Disneyland. 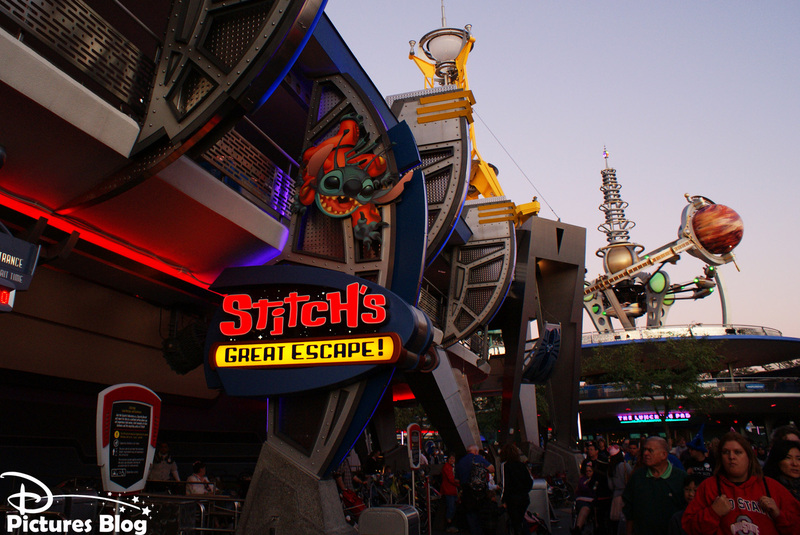 Enfin deux attractions inédites accueillent les visiteurs : Stitch's Great Escape et The Monsters Inc Laugh Floor Comedy Club. 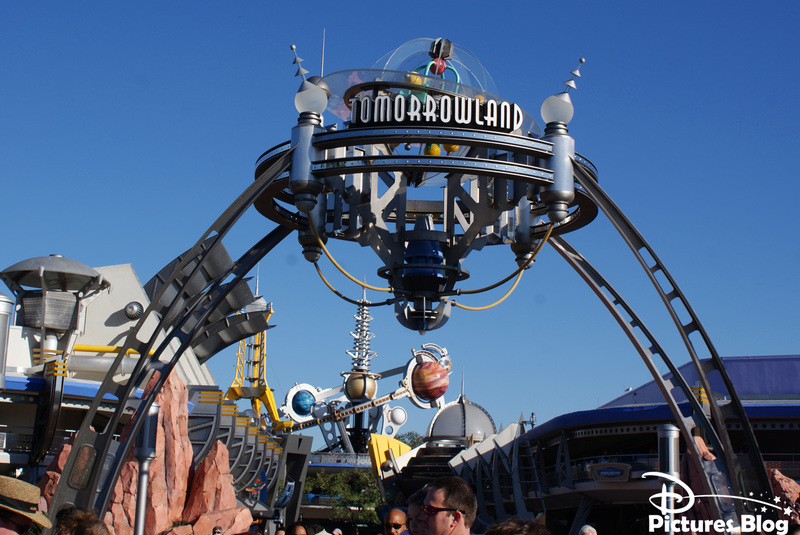 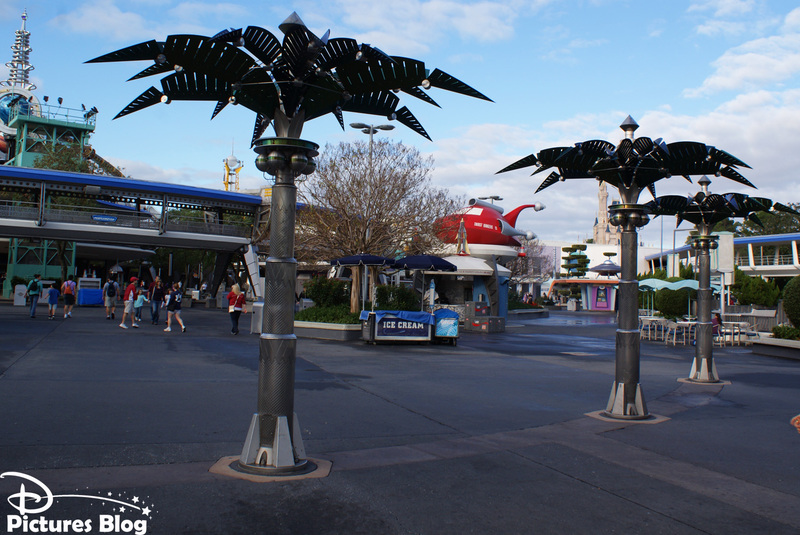 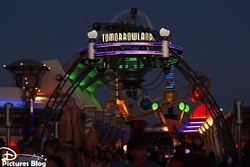 Tomorrowland is an old fashioned futuristic area representing the 2000s image that people had in the 70s. 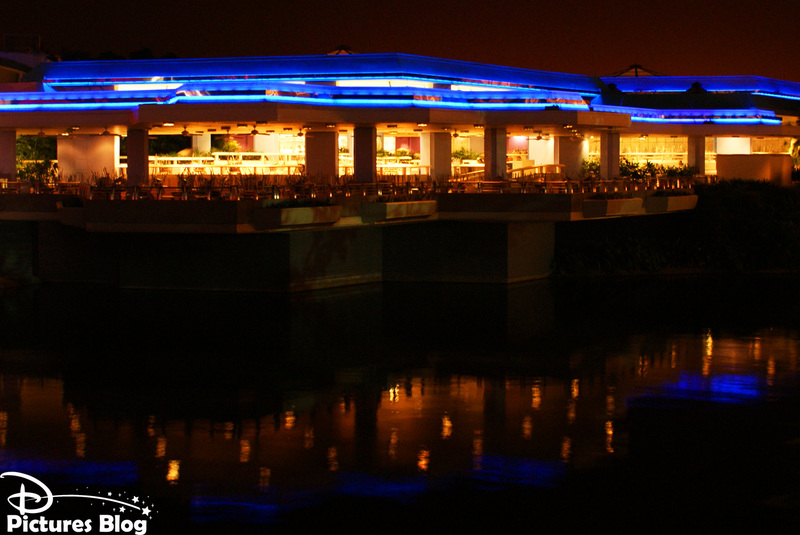 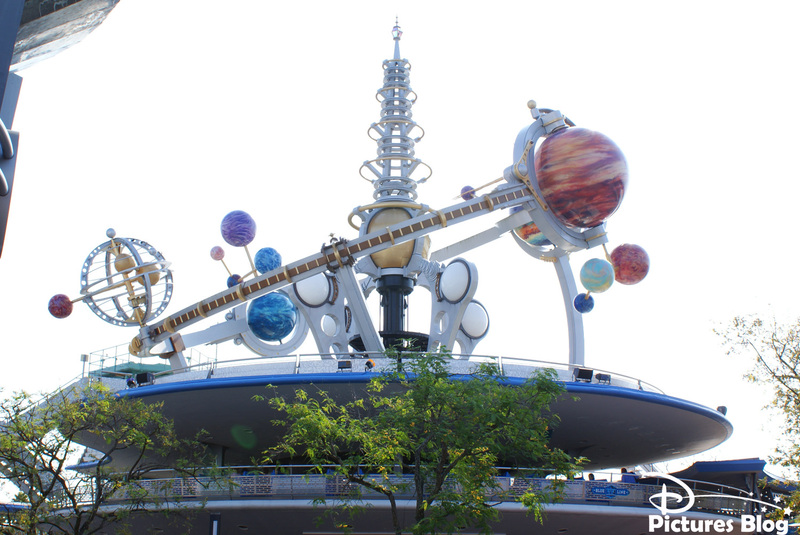 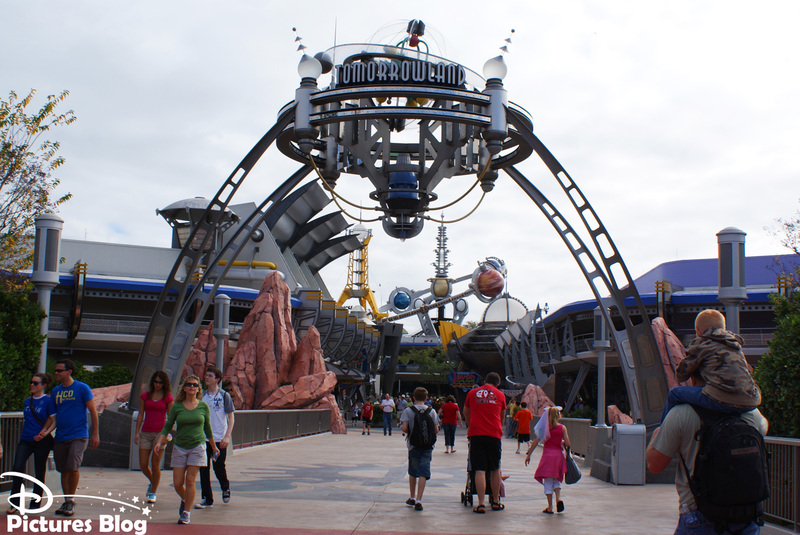 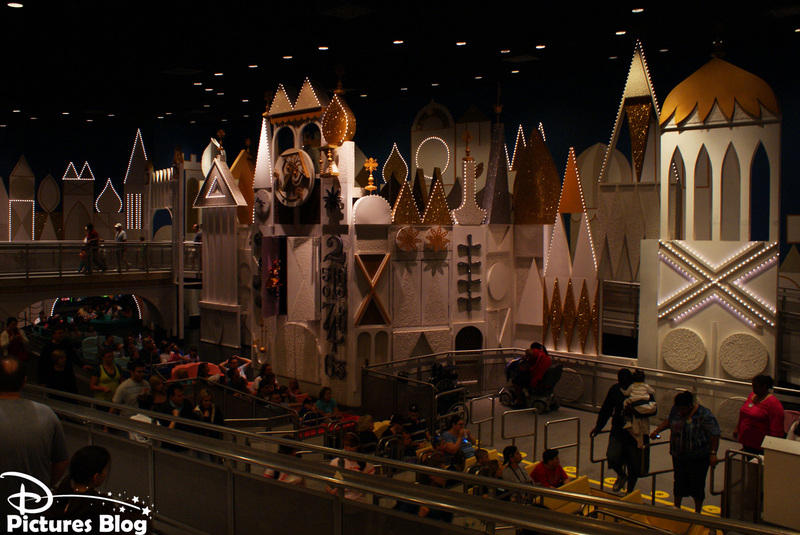 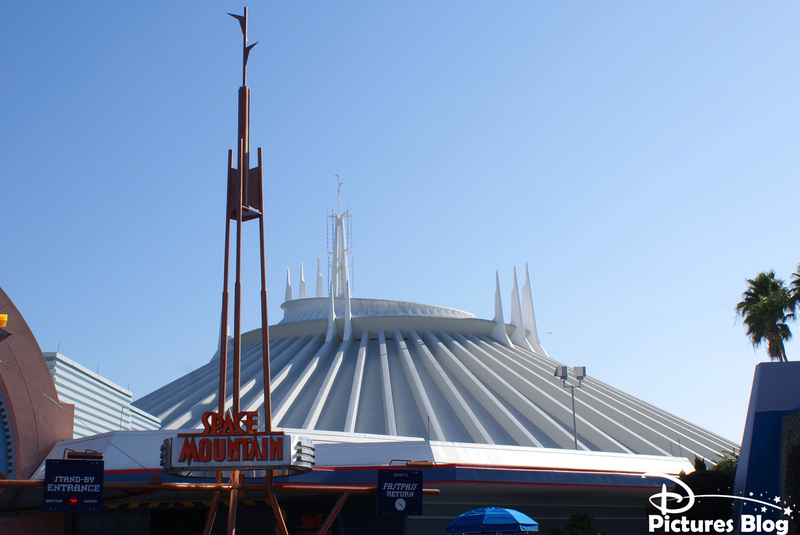 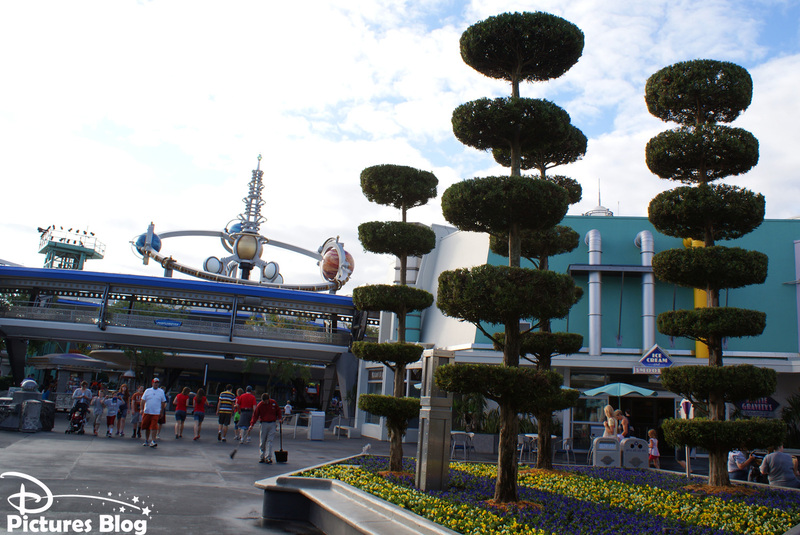 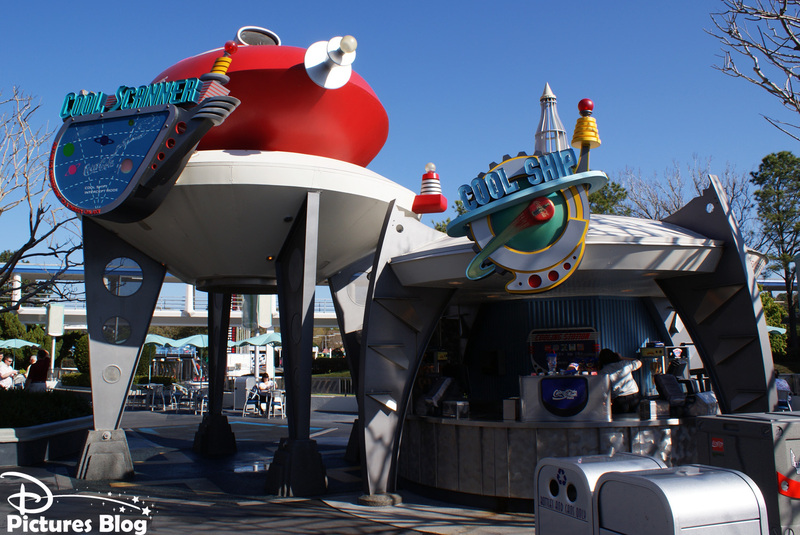 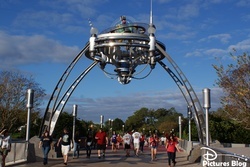 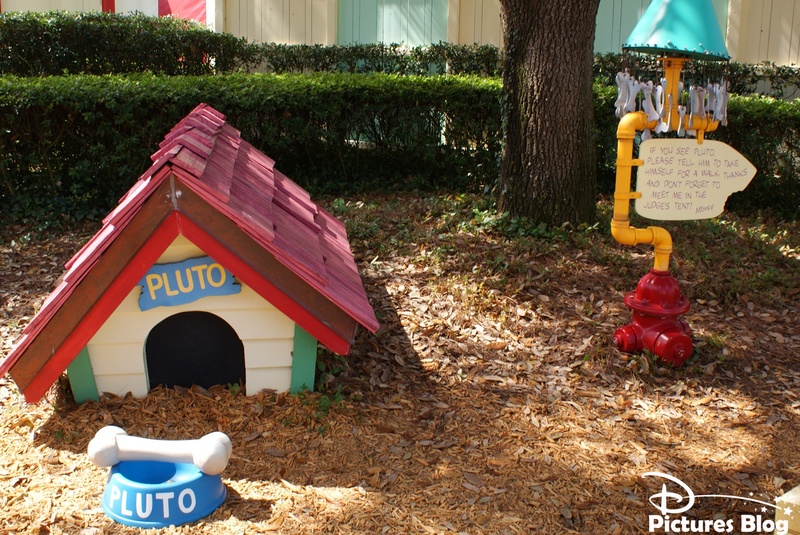 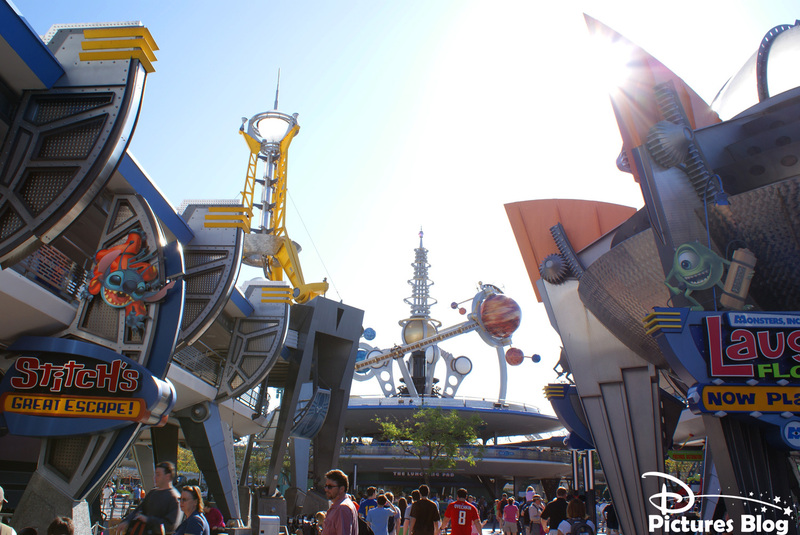 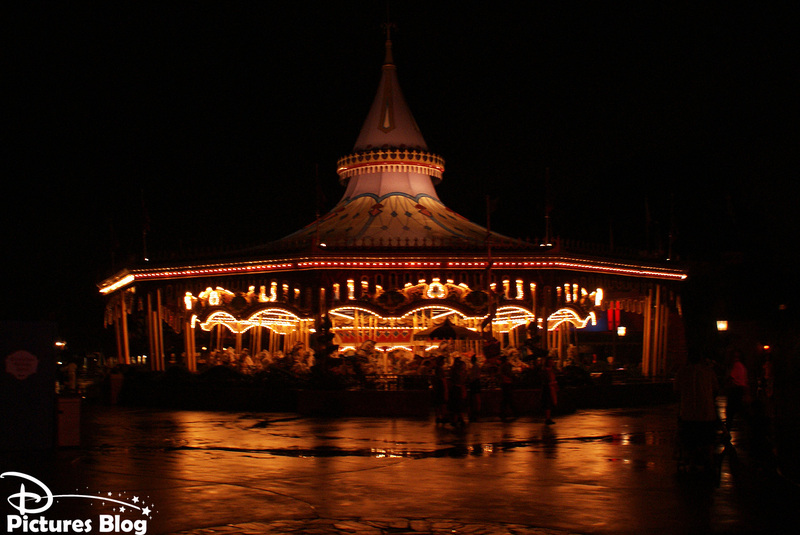 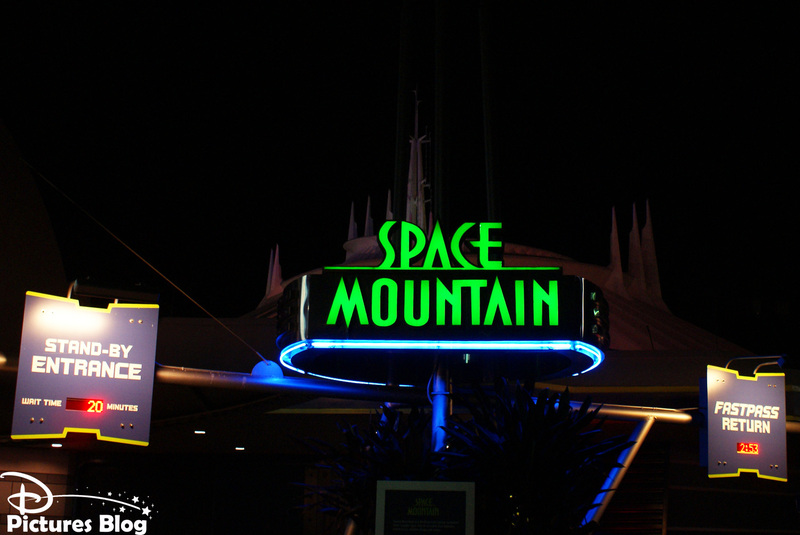 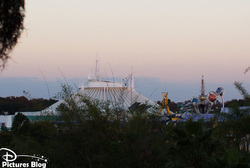 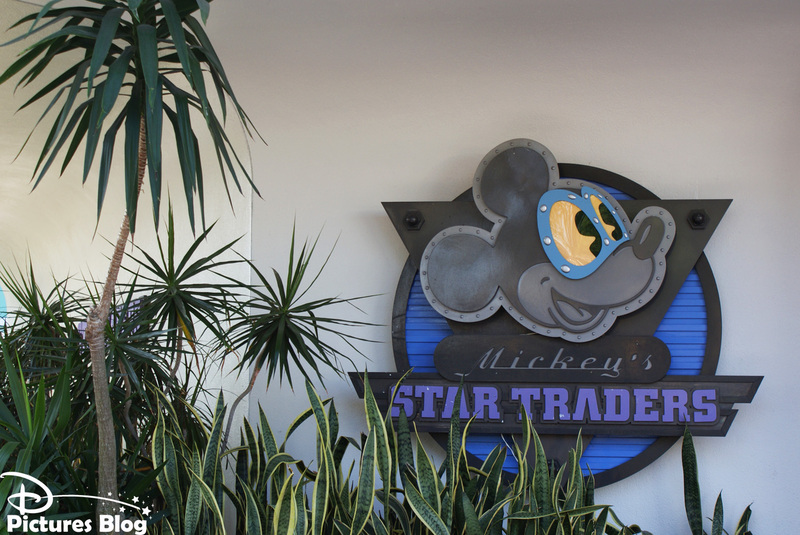 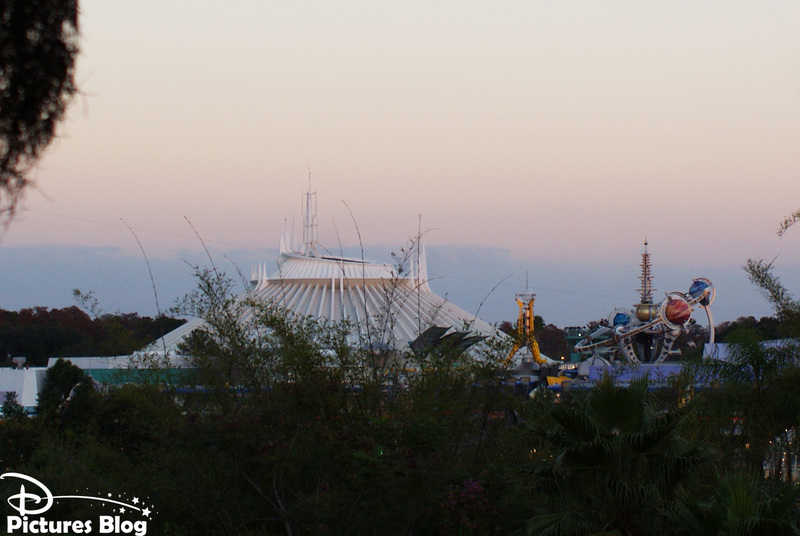 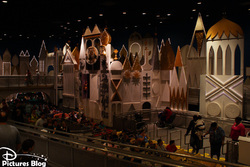 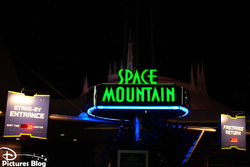 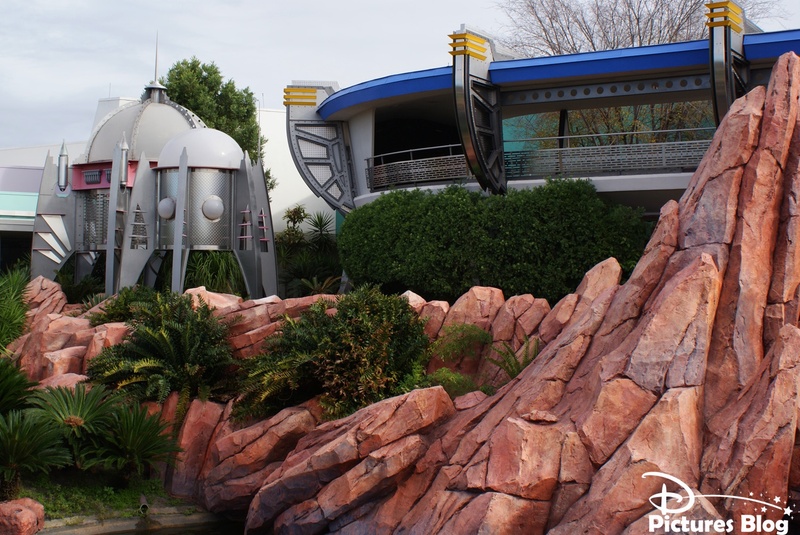 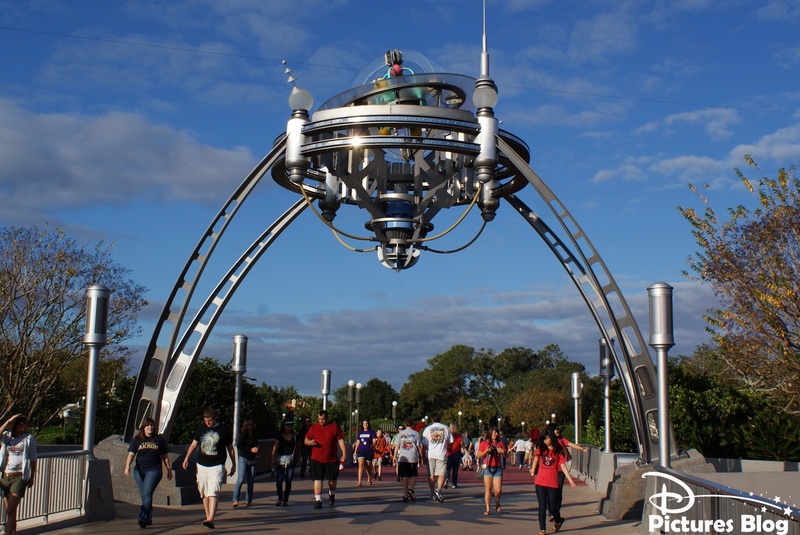 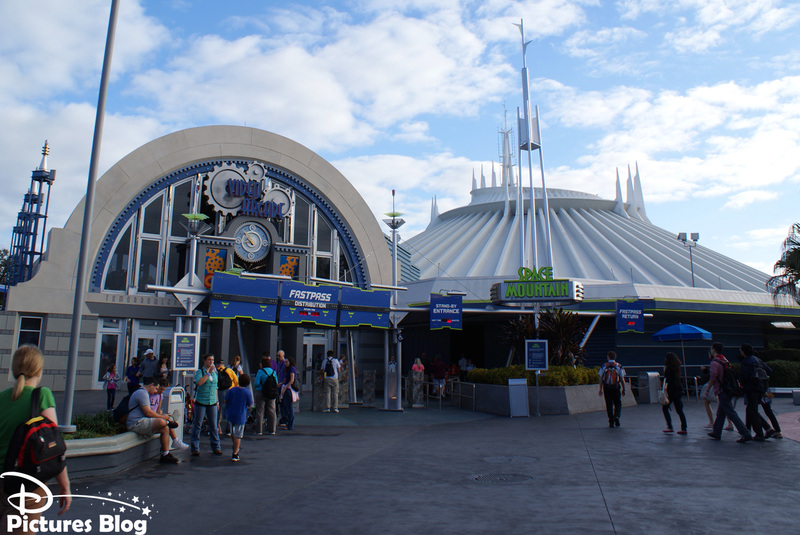 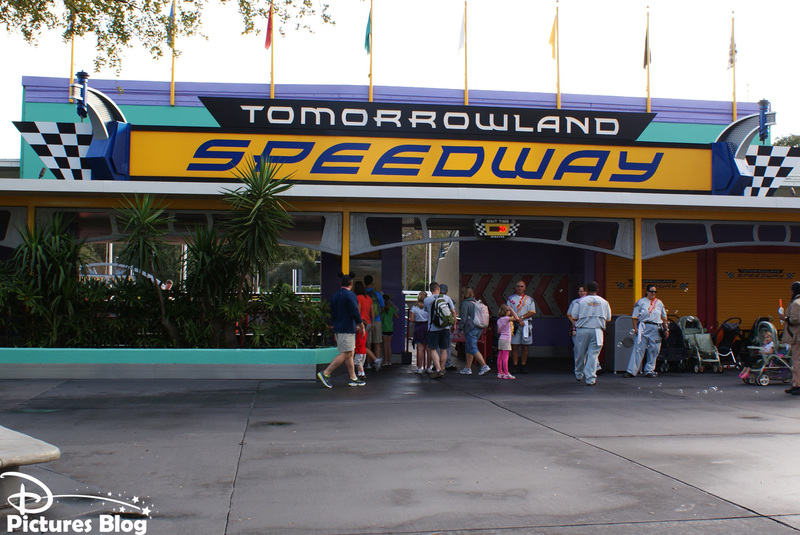 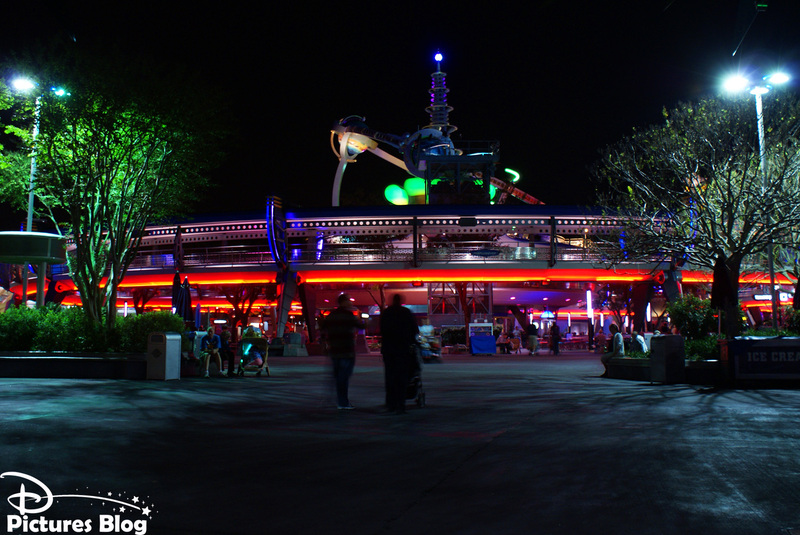 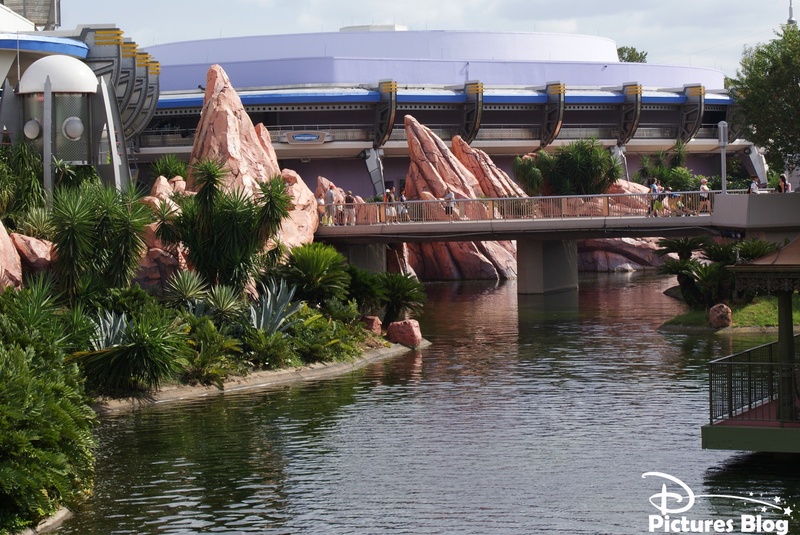 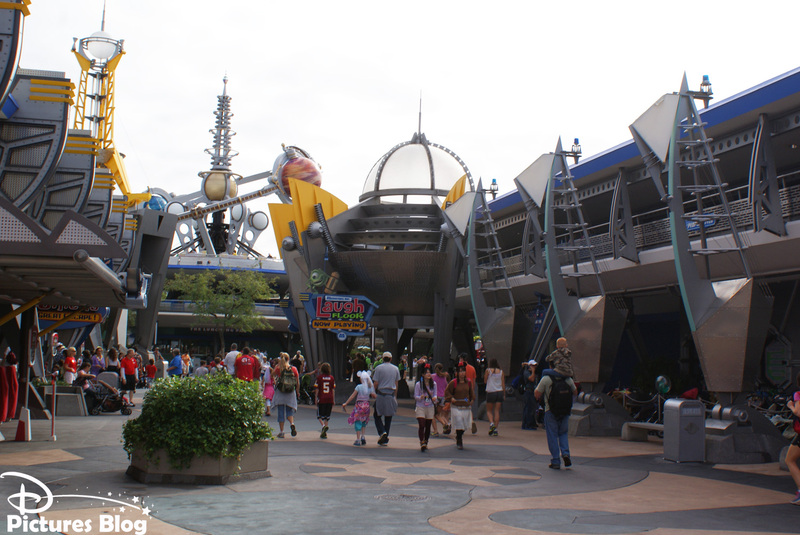 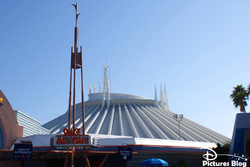 Building are rounded and metallic, recalling space and journeys, hosting familiar rides such as Tomorrowland Speedway (Magic Kingdom's version of Disneyland's Autopia), Astro-Orbiter, Buzz Lightyear's Space Ranger Spin and Space Mountain. 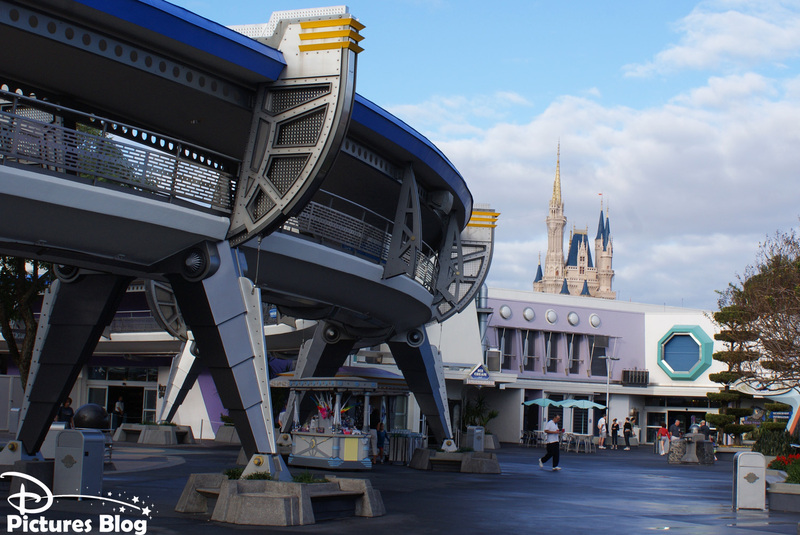 Guests also get to experience real Disney history pieces through Walt Disney's Carroussel of Progress and Tomorrowland Transit Authority, two rides originally featured in Disneyland. 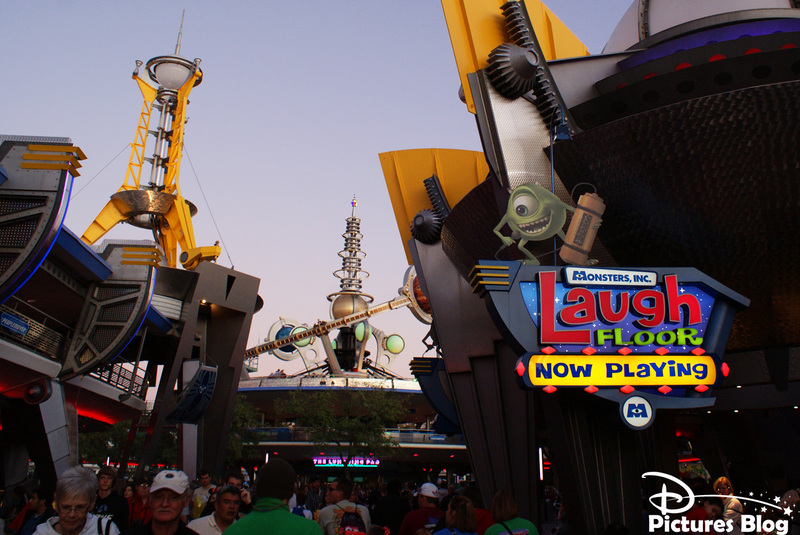 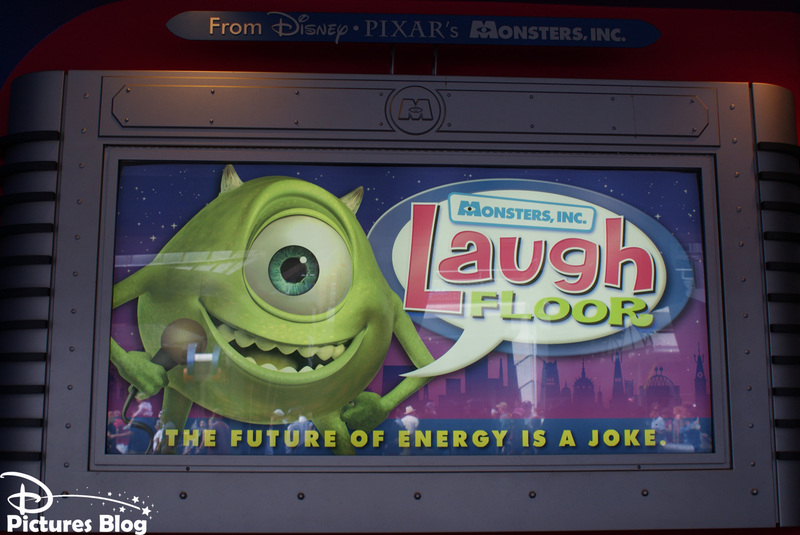 Also, two exclusive rides welcome guests in Tomorrowland : Stitch's Great Escape and The Monsters Inc Laugh Floor Comedy Club. 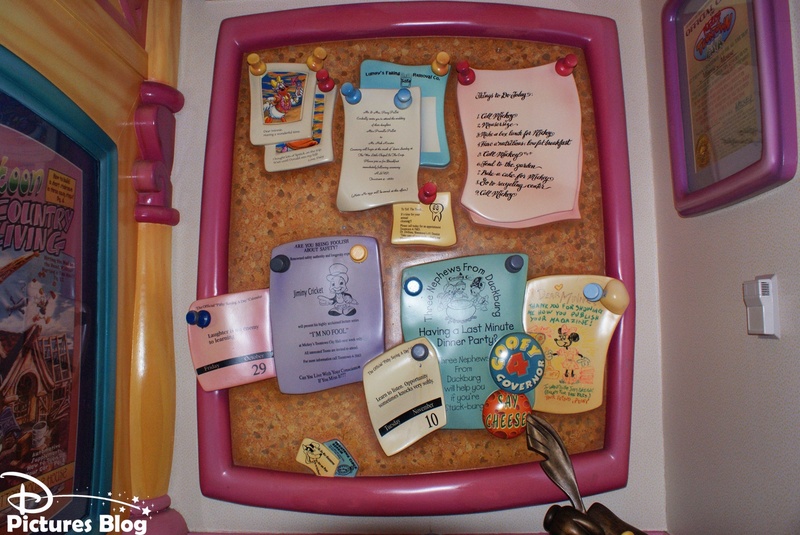 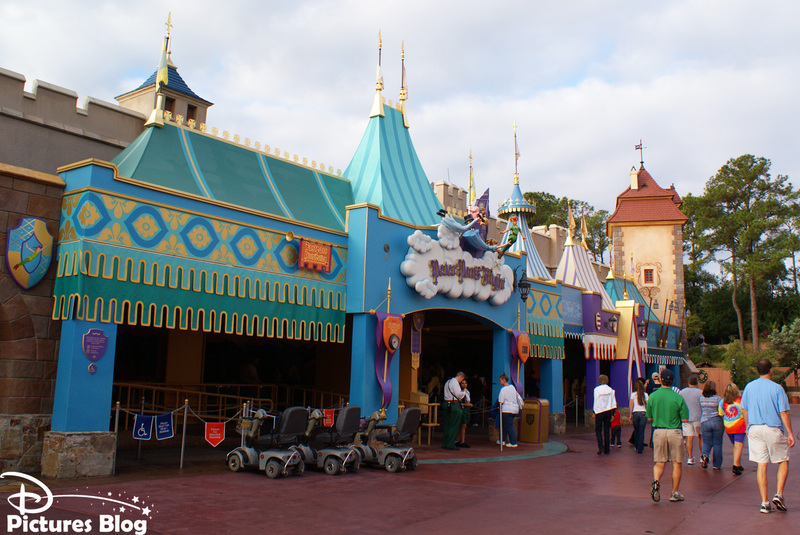 Ouvert en 1988 en tant que Mickey's Birthday Land, Mickey's ToonTown Fair a fermé définitivement en 2010 pour faire place au New Fantasyland. 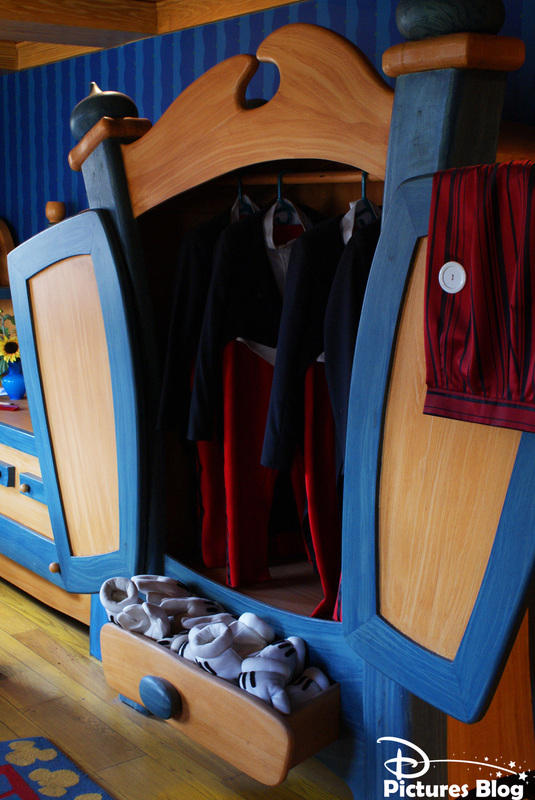 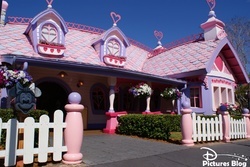 Ce n'était pas la ville des toons façon Roger Rabbit (elle se trouve à Disneyland en Californie) mais la résidence de vacances de Mickey et ses amis. 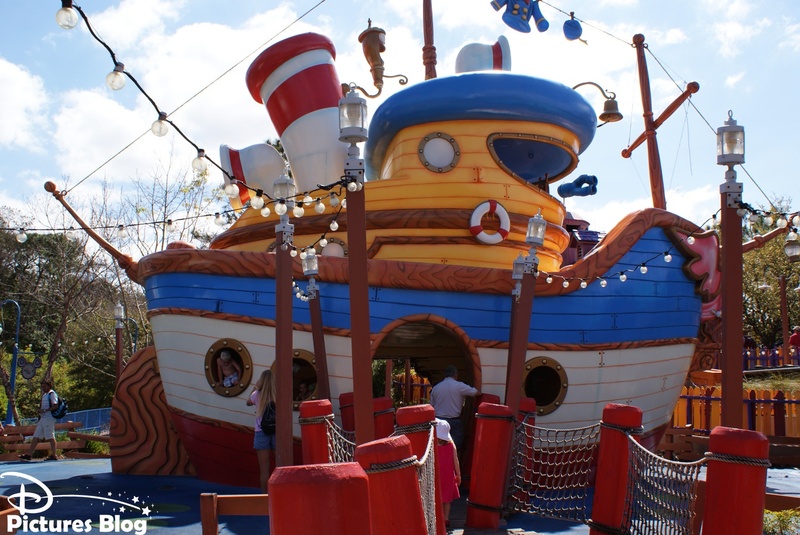 C'était un petit Land plein de charme et de clins d'oeil à l'univers des Toons, où l'on pouvait visiter les maisons de Mickey et Minnie en rencontrant nos hôtes, embarquer sur le kiddy coaster The Barnstormer, ou encore rendre visite aux Princesses et aux Fées au Toon Town Hall of Fame. 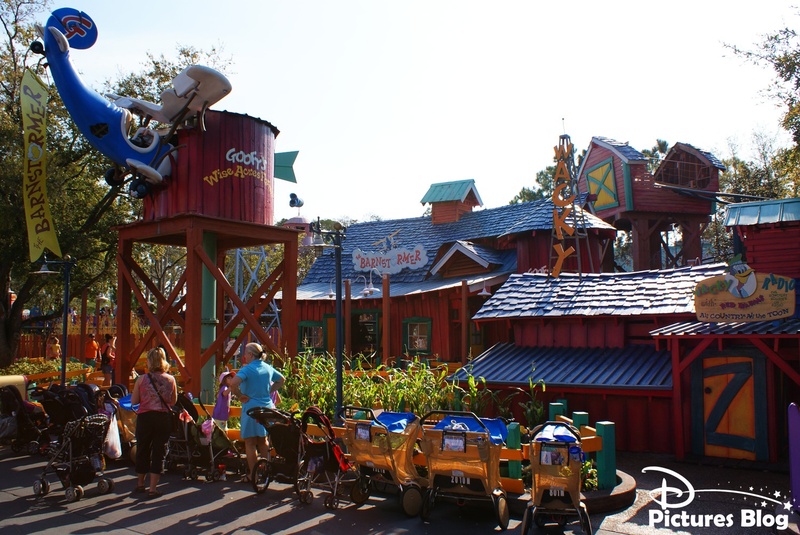 Magic Kingdom's 7th Land : Mickey's Toon Town Fair, opened in 1988 as Mickey's Birthday Land, closed in 2010 to make place for the New Fantasyland. 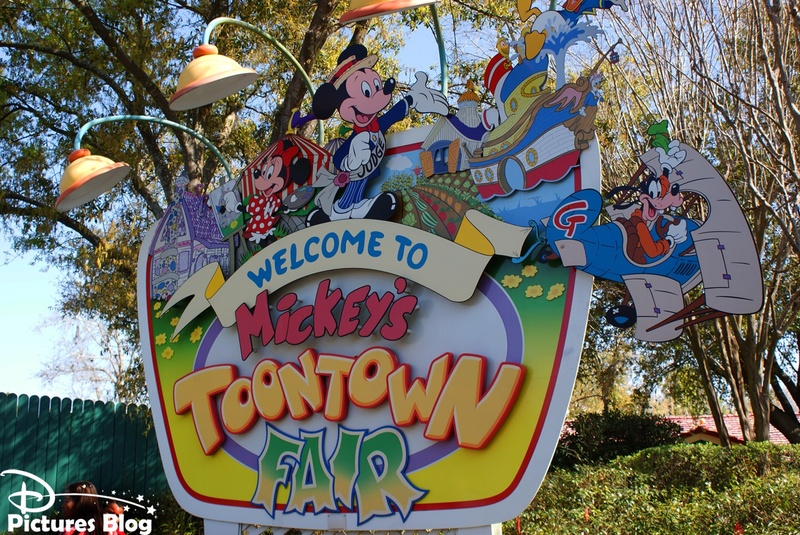 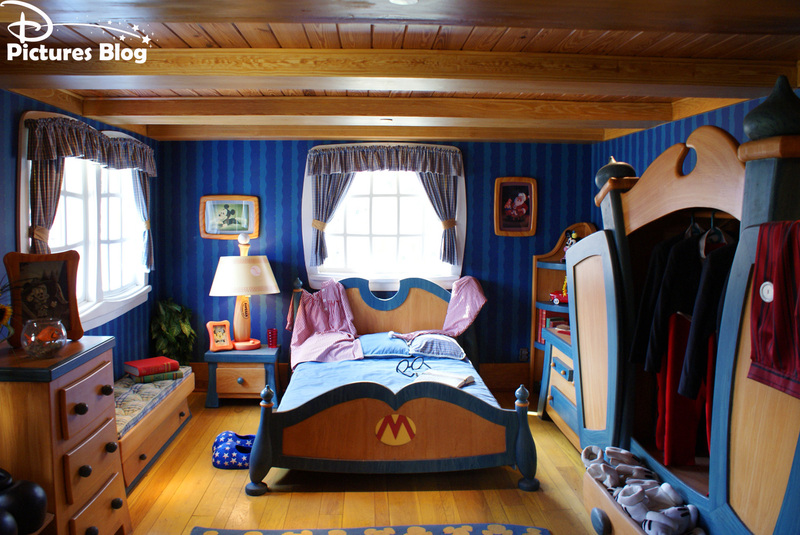 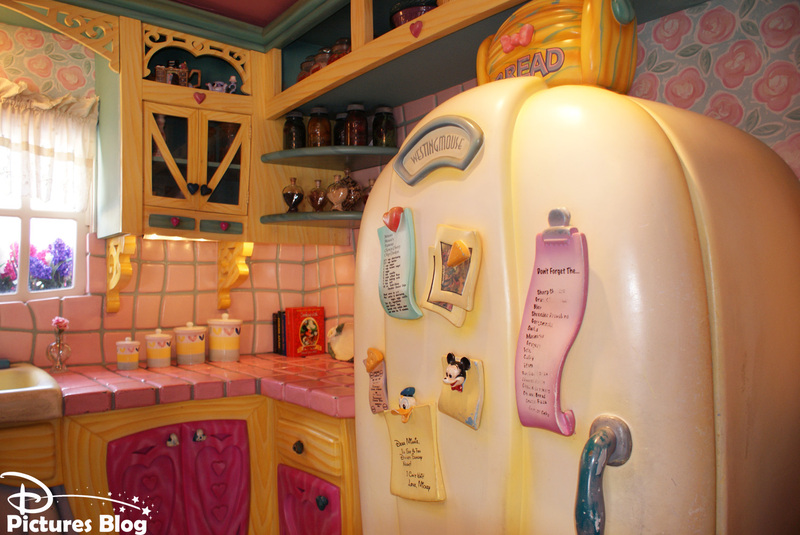 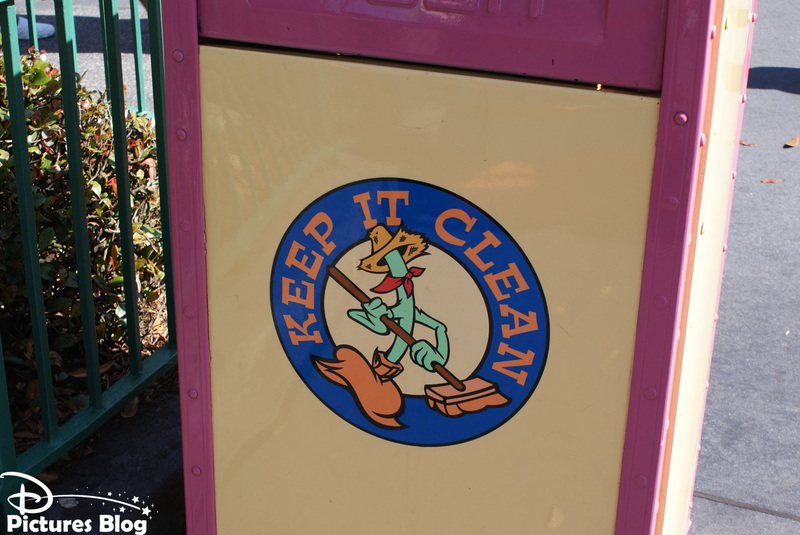 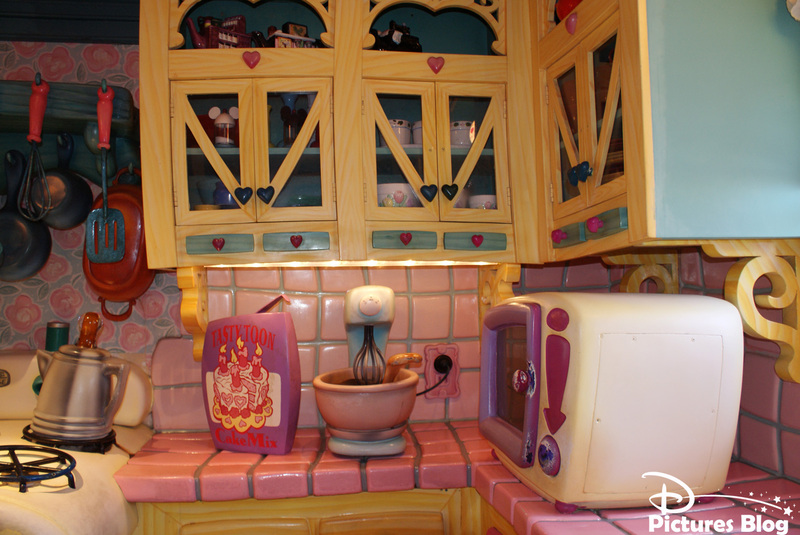 Contrary to Mickey's Toon Town (Disneyland, in California), it was not the place where the toons actually live, Roger Rabbit style, but Mickey and friends vacations place. 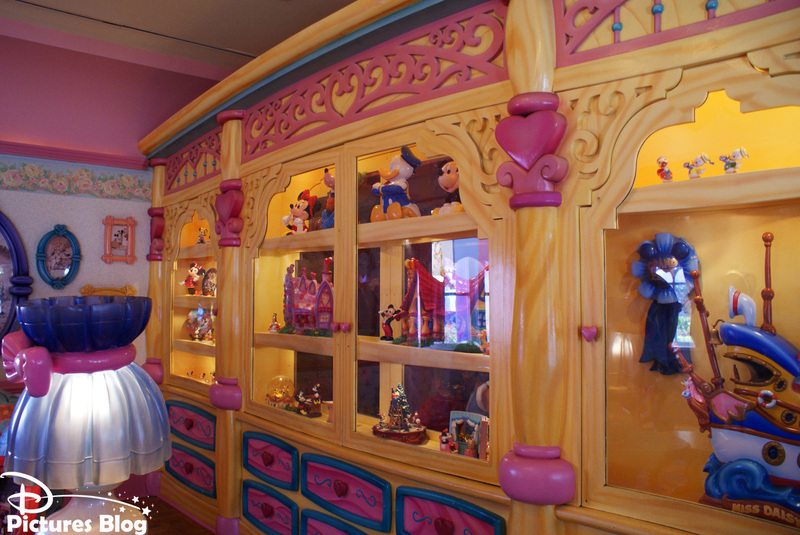 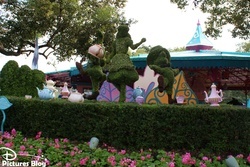 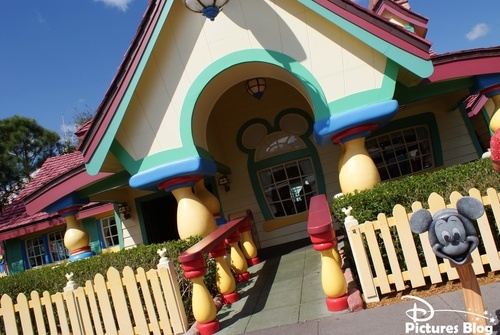 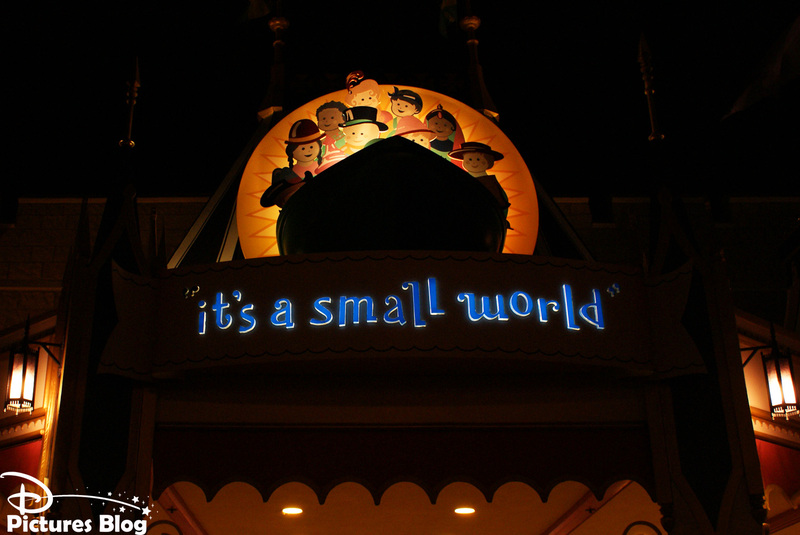 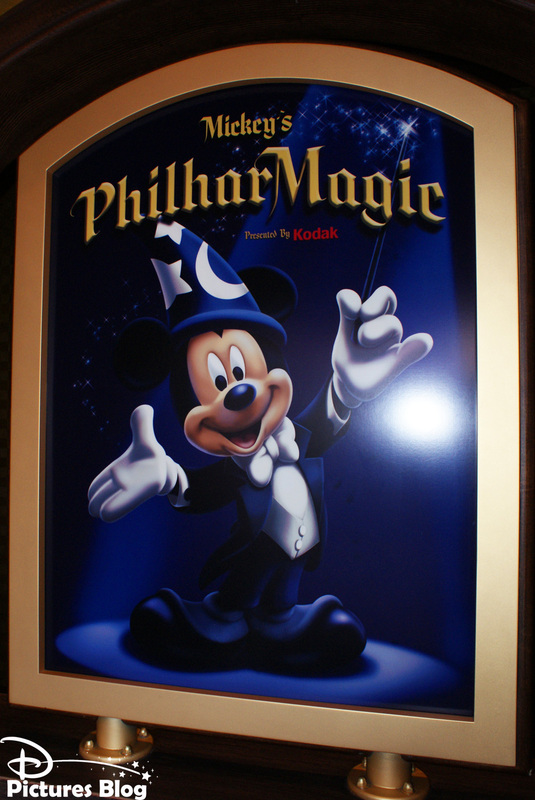 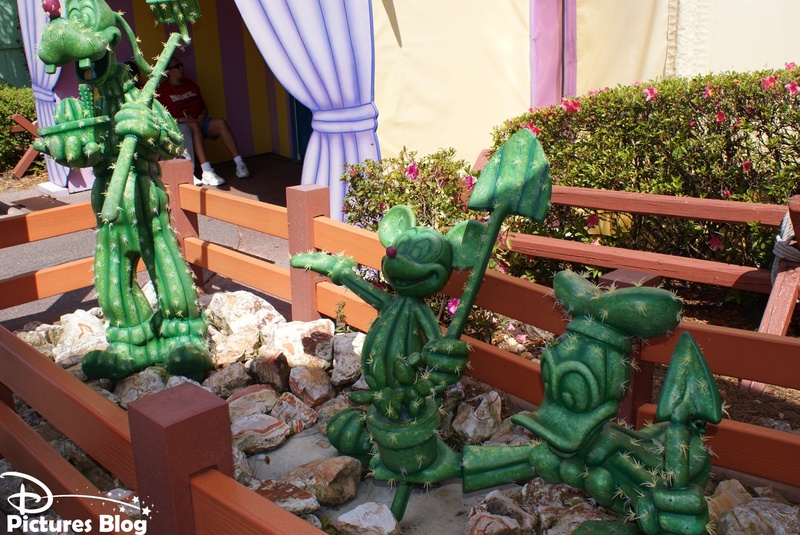 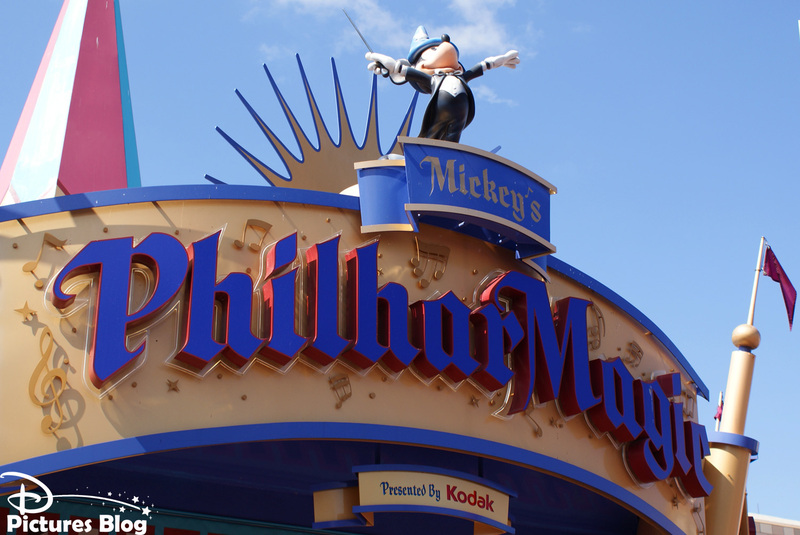 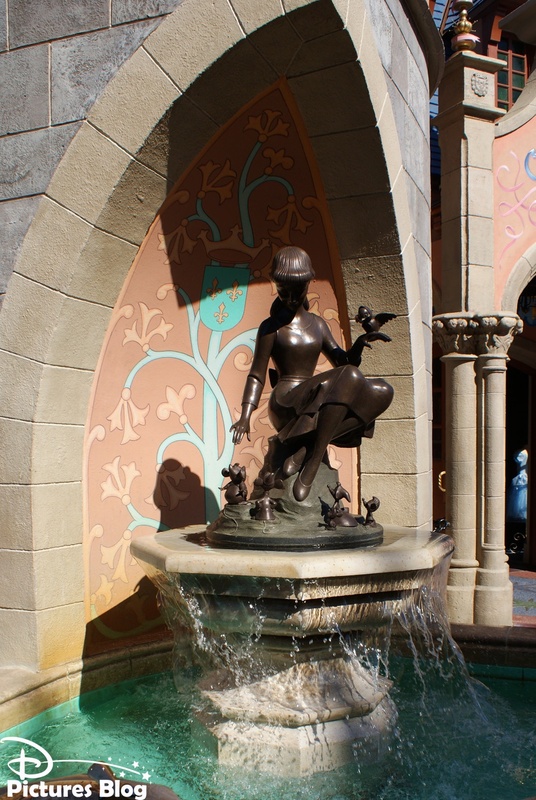 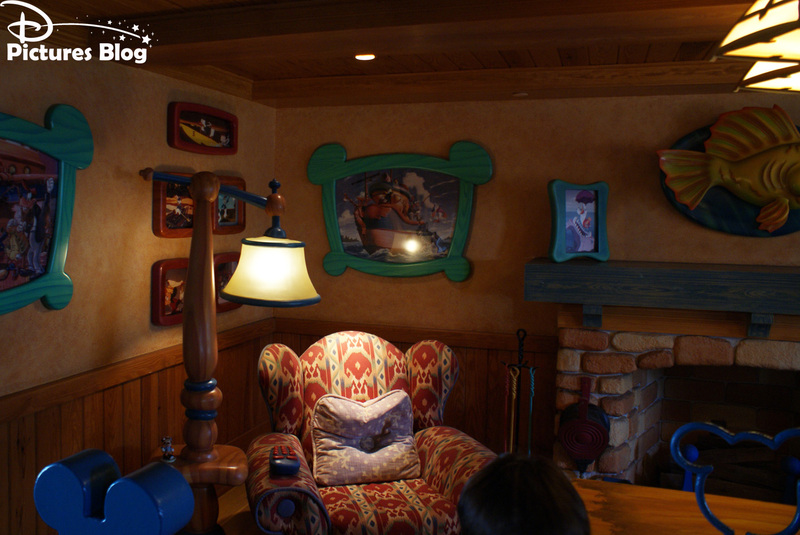 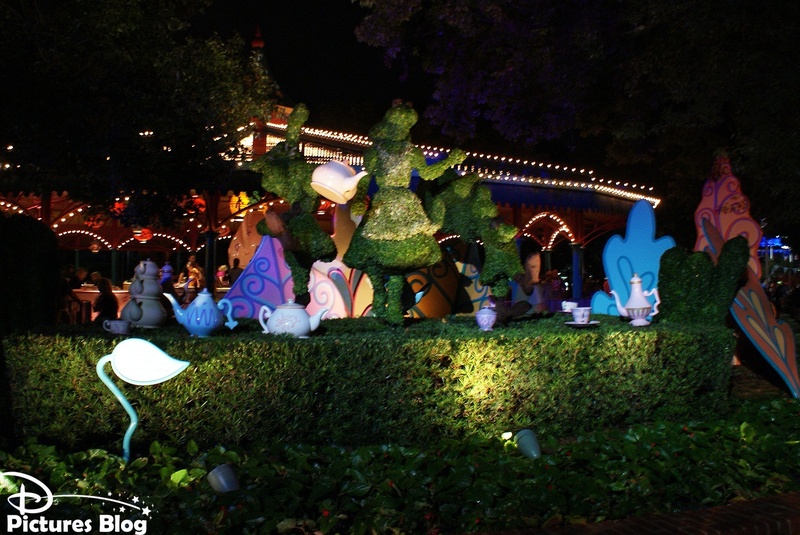 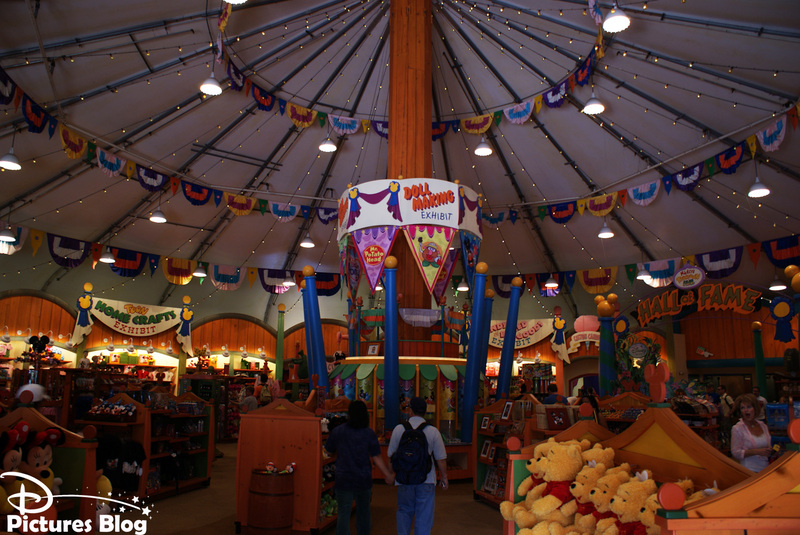 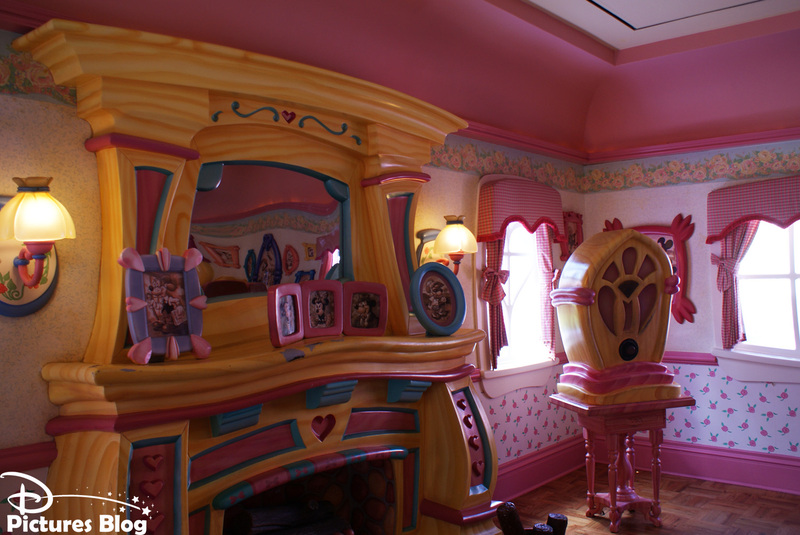 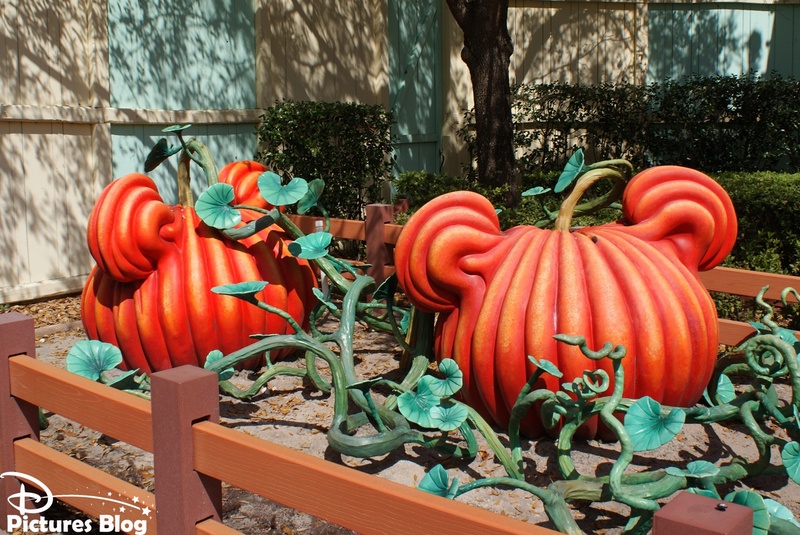 It was a nice charming little Land, full with toons references, where guests were able to visit Mickey and Minnie Mouse houses and meeting them, ride the Barnstormer and visit the Disney Princesses and Fairies in the Toon Town Hall of Fame. 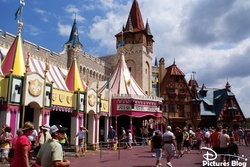 A l'heure où nous écrivons et comme lors de notre dernière visite, le Fantasyland du Magic Kingdom subit d'importantes transformations et extensions. 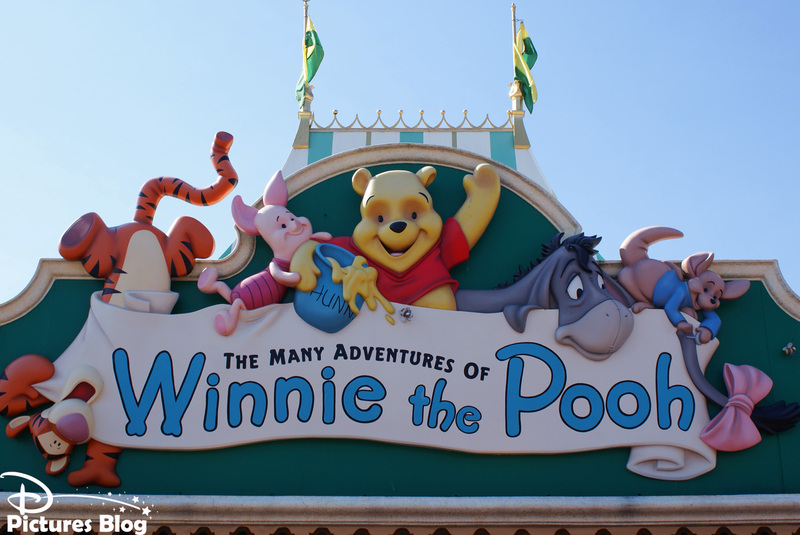 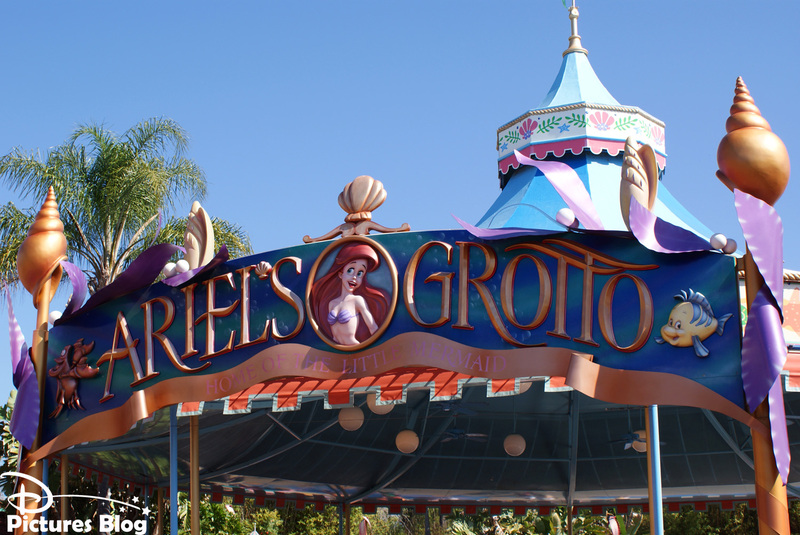 Nous visiterons le Fantasyland historique, tel qu'il apparaissait jusqu'en 2010 avec Peter Pan's Flight, The Many Adventures of Winnie the Pooh, Mad Hatter's Tea Cups, Dumbo the Flying Elephant, It's A Small World, Ariel's Grotto, Snow White's Scary Adventures, et le plus récent Mickey's Philarmagic. 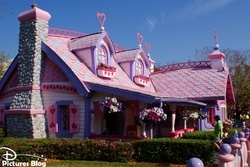 Le tout dans un univers kitsch et coloré évoquant une fête foraine médiévale. 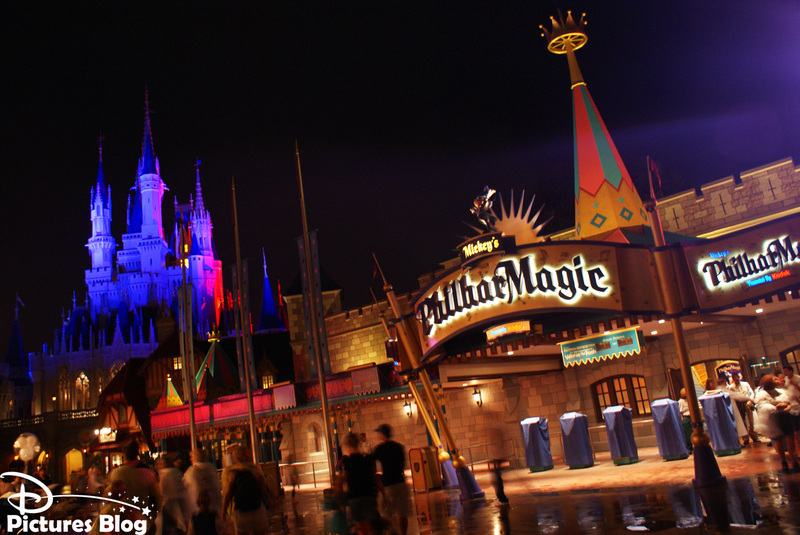 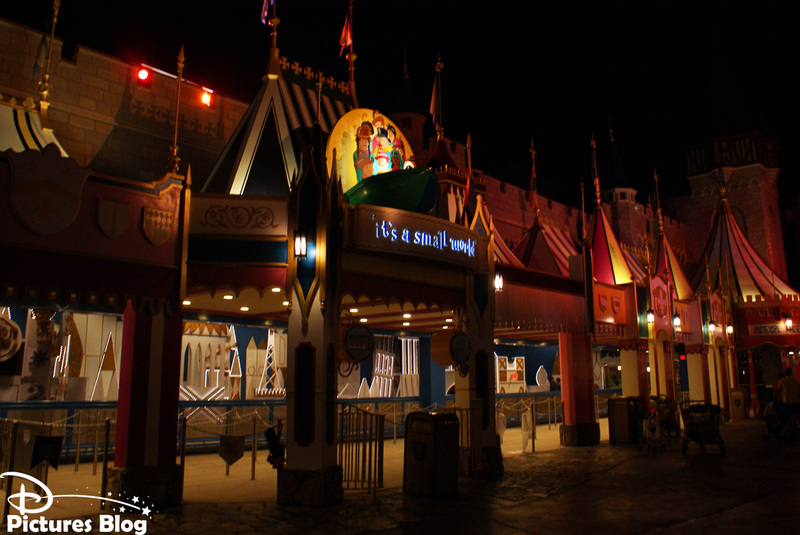 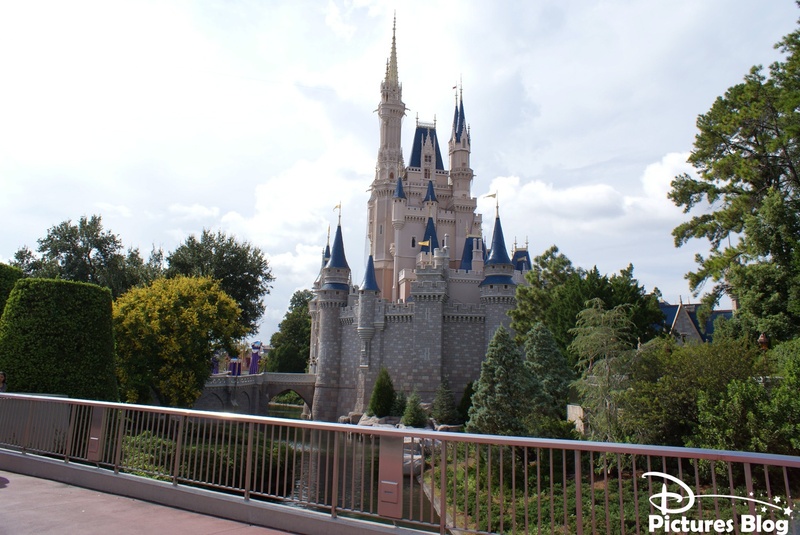 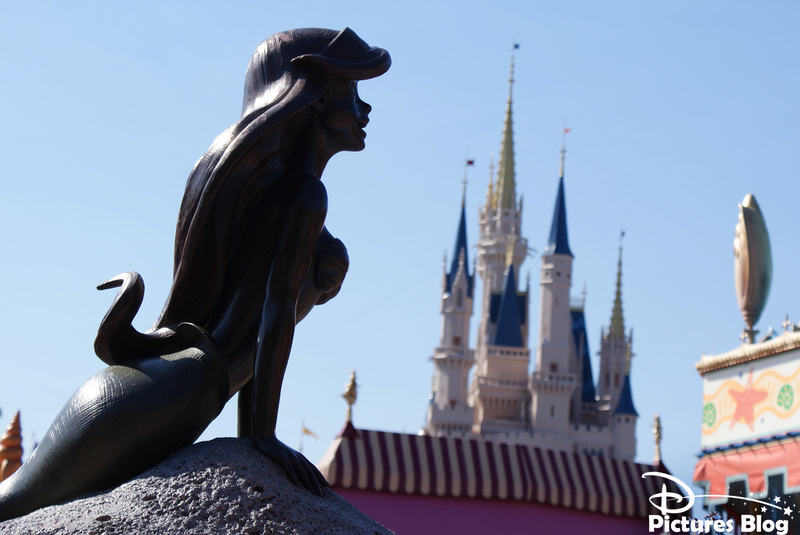 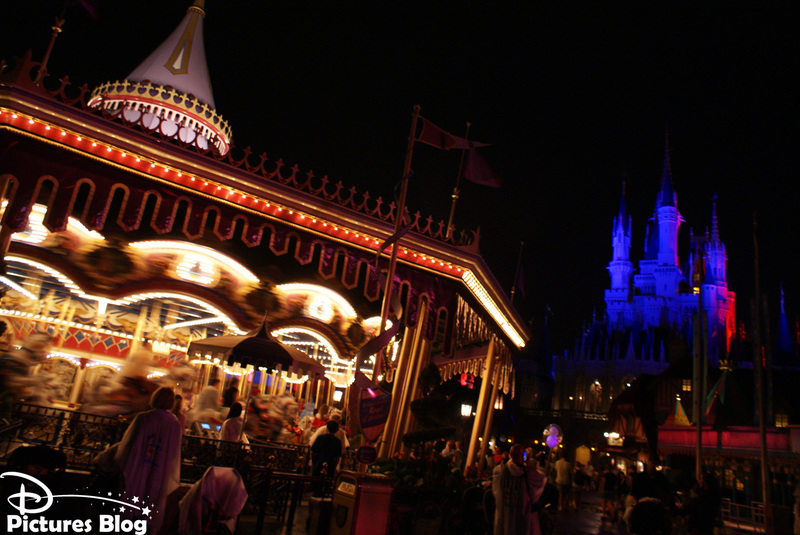 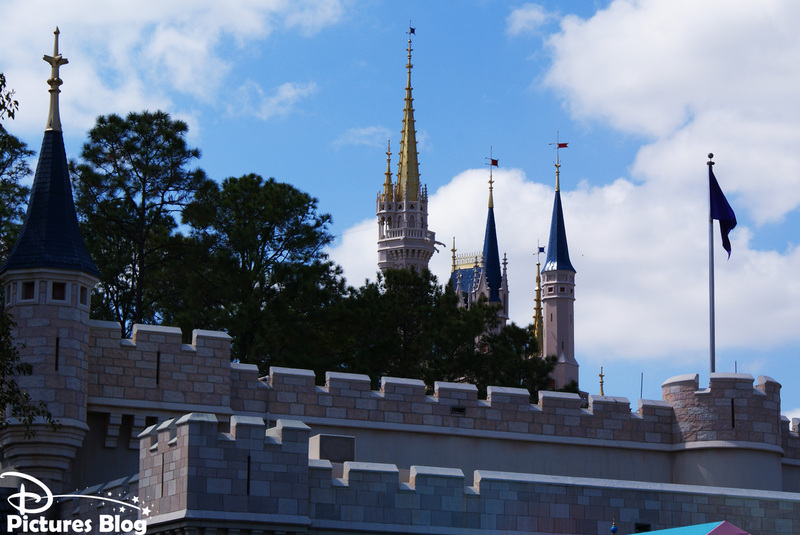 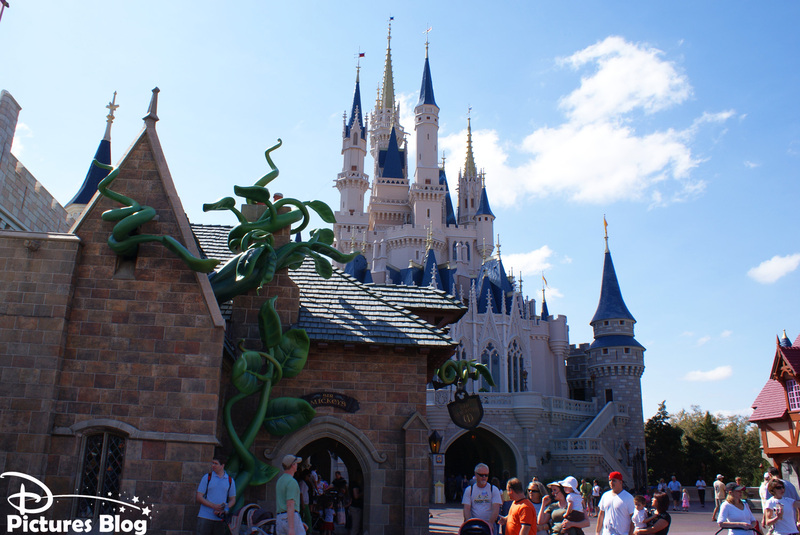 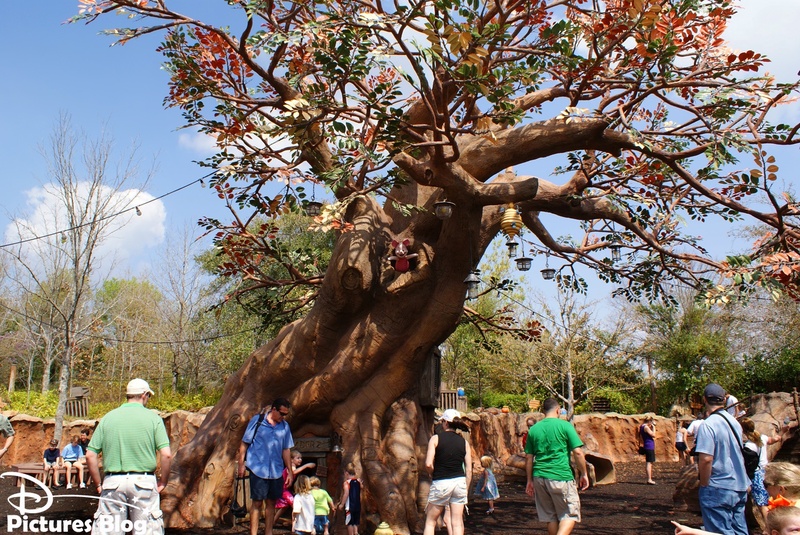 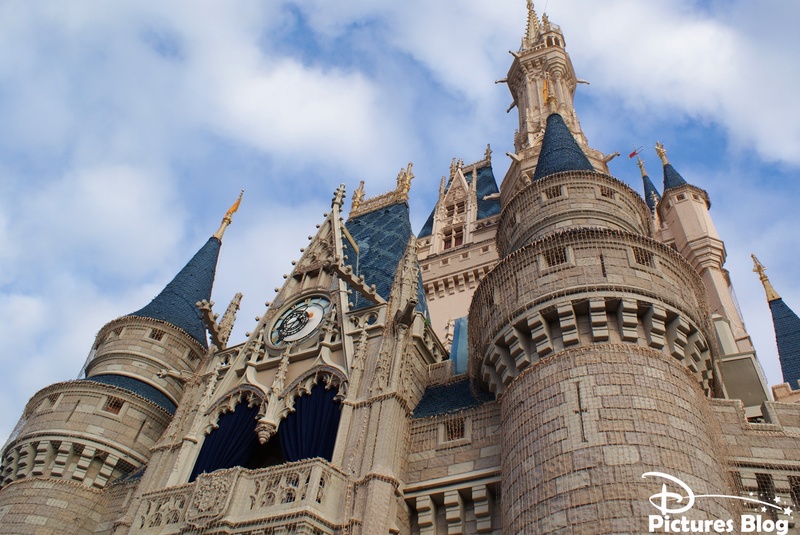 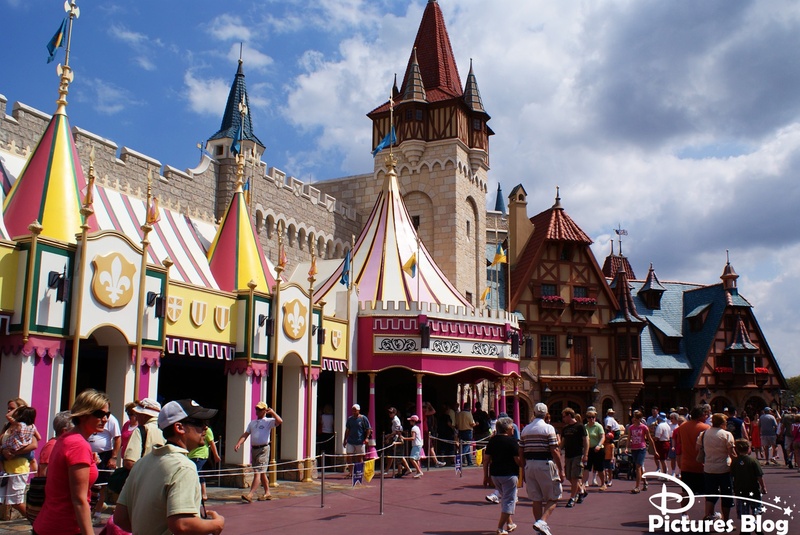 While we are writing this post and as we last visited it, the Magic Kingdom's Fantasyland is undergoing major transformations. 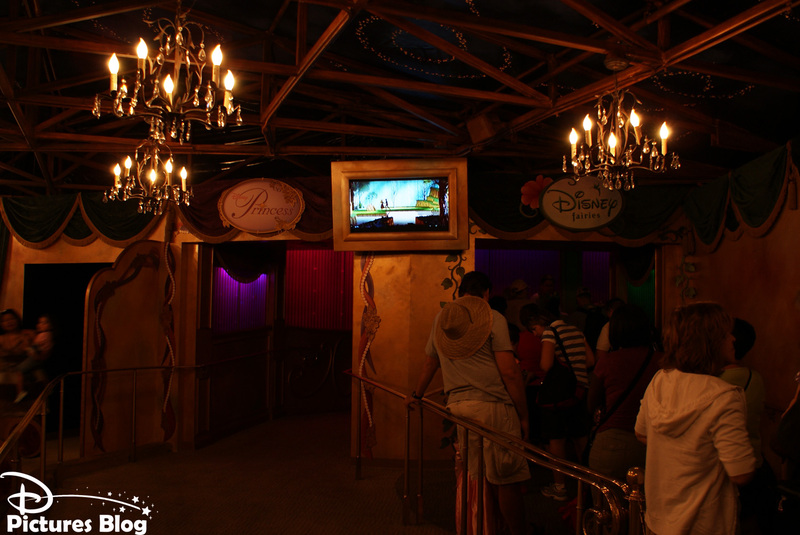 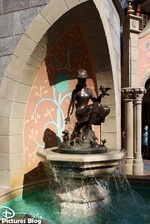 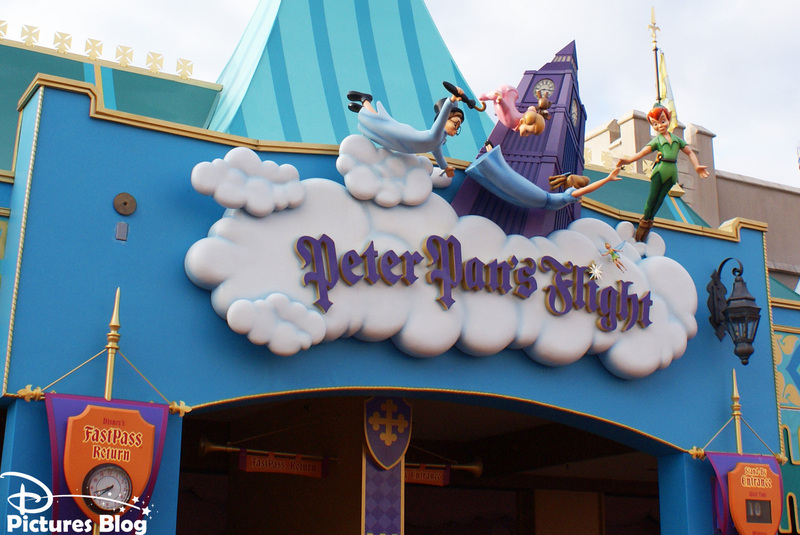 We will take you on a tour of the "old" Fantasyland, as it was until 2010, including Peter Pan's Flight, The Many Adventures of Winnie the Pooh, Mad Hatter's Tea Cups, Dumbo the Flying Elephant, It's A Small World, Ariel's Grotto, Snow White's Scary Adventures, and the most recent Mickey's Philarmagic. 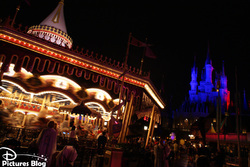 All in an old fashioned medieval fair atmosphere. 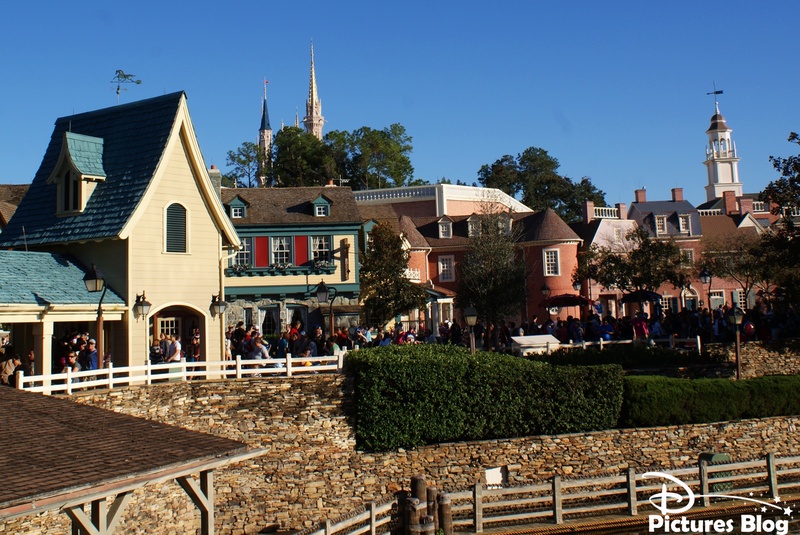 Liberty Square est un Land spécifique au Magic Kingdom présentant des répliques de la Liberty Bell et du Liberty Tree. 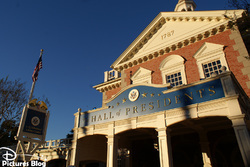 C'est un hommage à l'Amérique coloniale et à la naissance des Etats-Unis et de leur idéal de liberté. 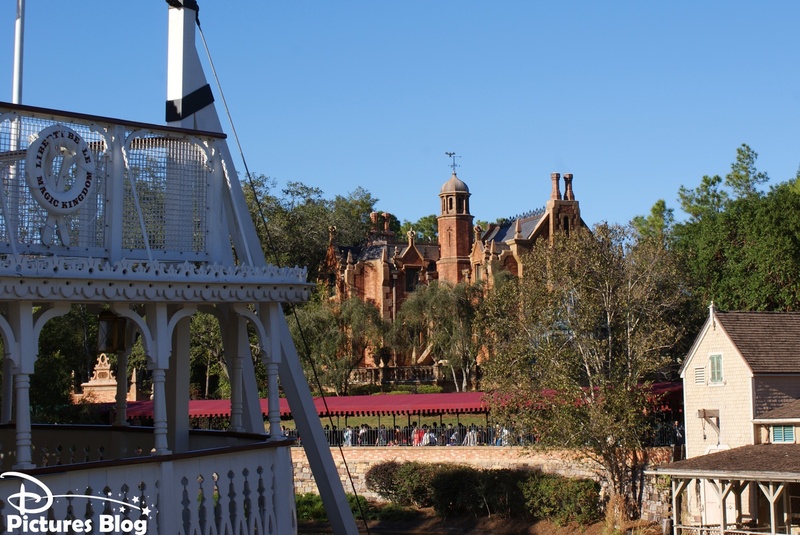 On y trouve de nombreux restaurants ainsi que trois attractions dont la célèbre Haunted Mansion et le classique Riverboat (ici appelé Liberty Belle). 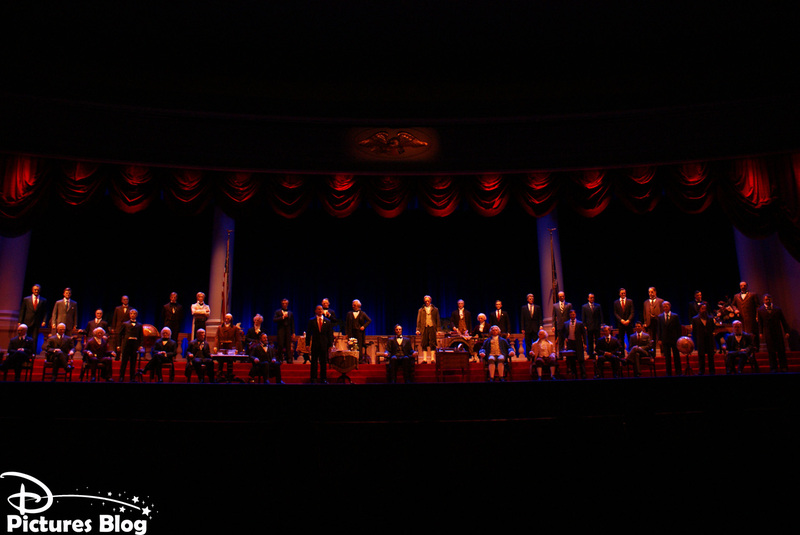 Enfin The Hall Of Presidents met en scène les 43 Présidents des Etats-Unis dans un spectacle unique d'audio-animatronique qui confère son âme au Land. 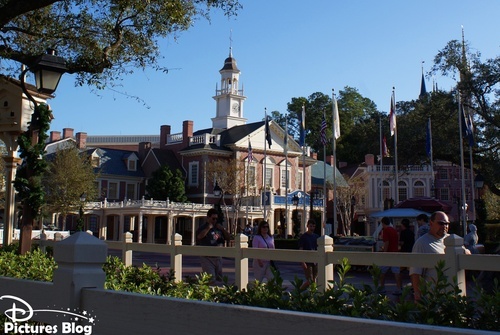 Liberty Square is exclusive to the Magic Kingdom, introducing Liberty Bell and Liberty Tree replicas. 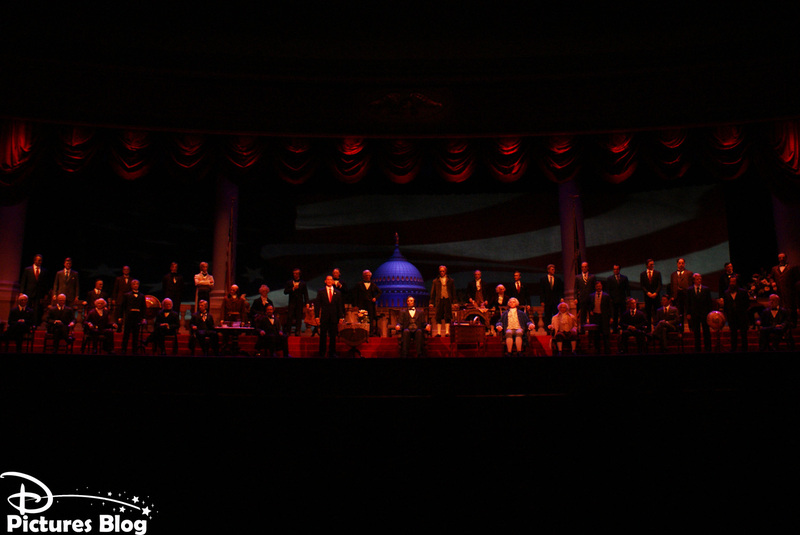 It is a tribute to colonial America and birth of the United States, along with their ideal of liberty. 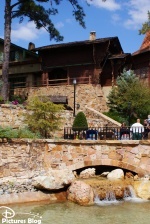 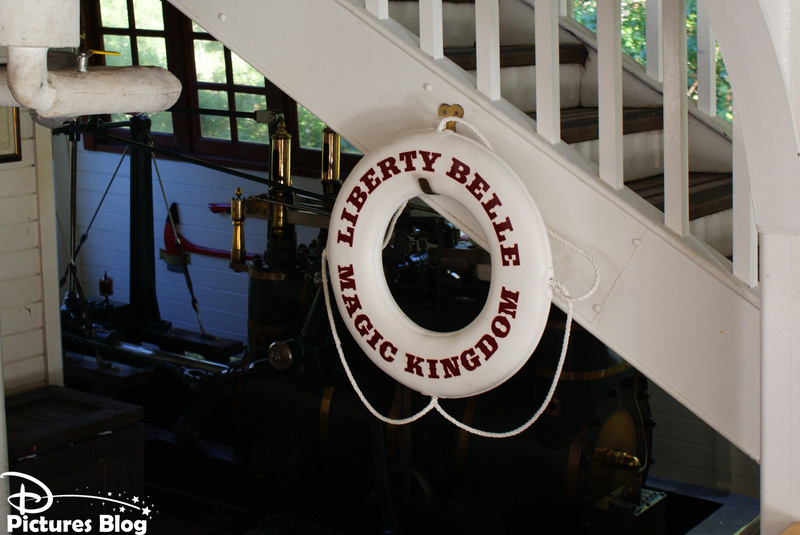 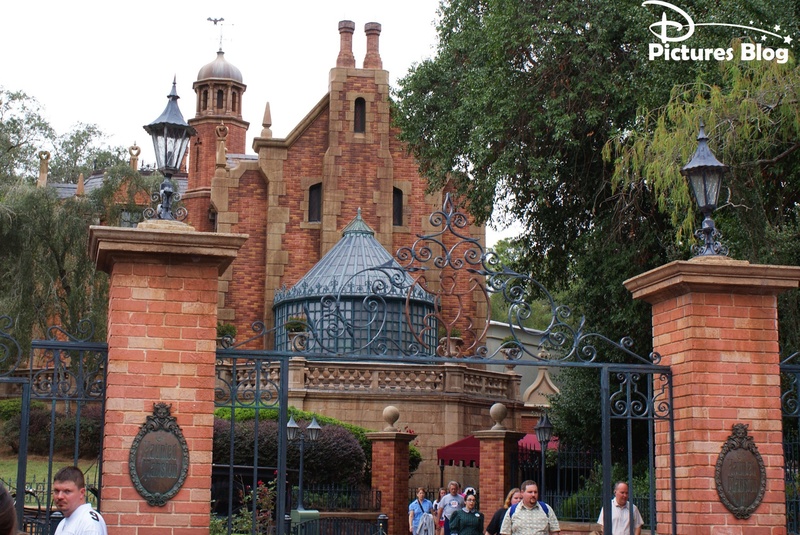 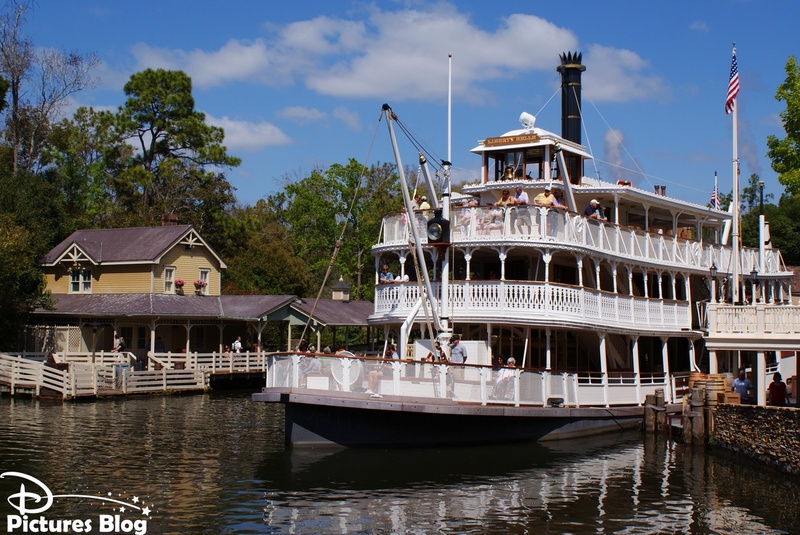 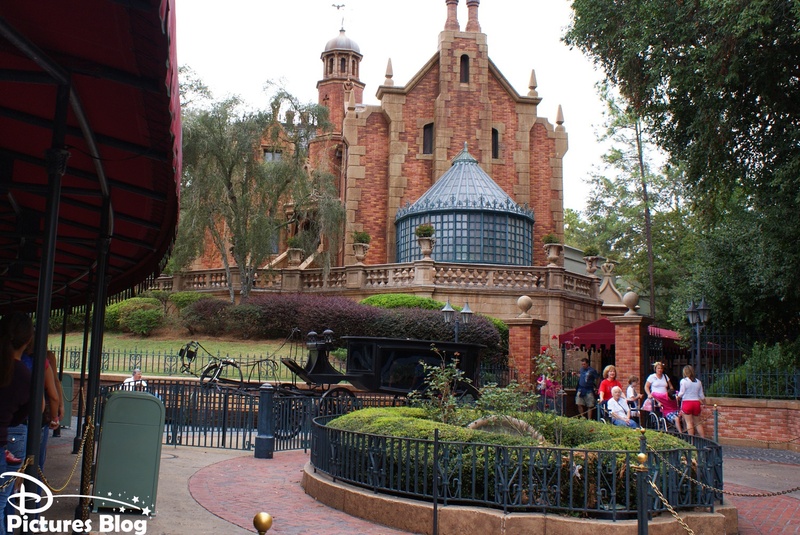 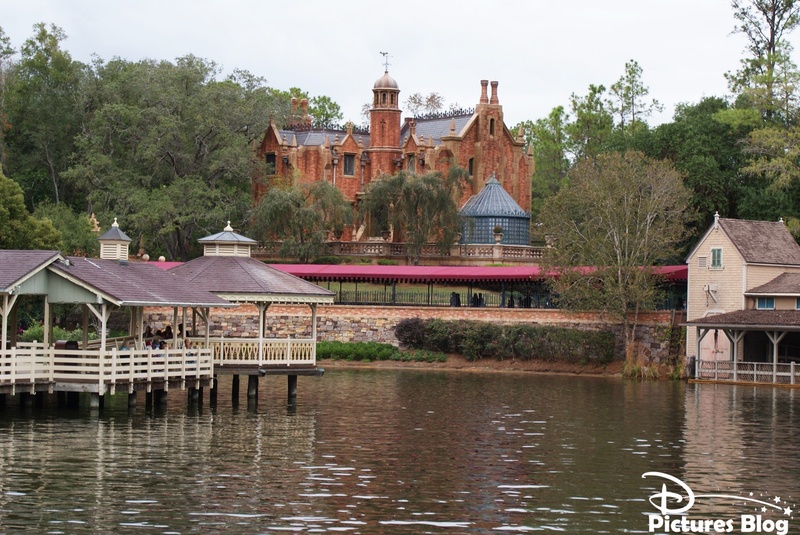 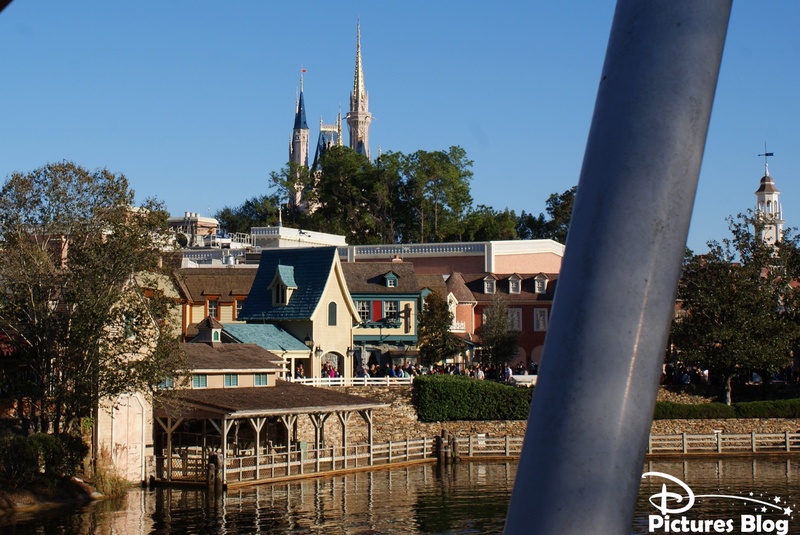 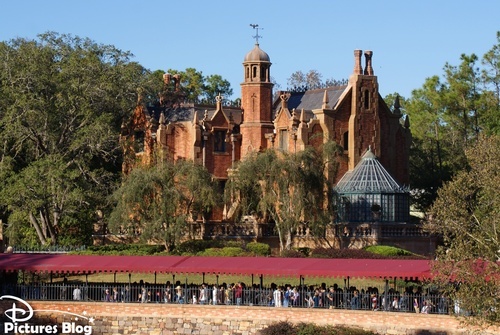 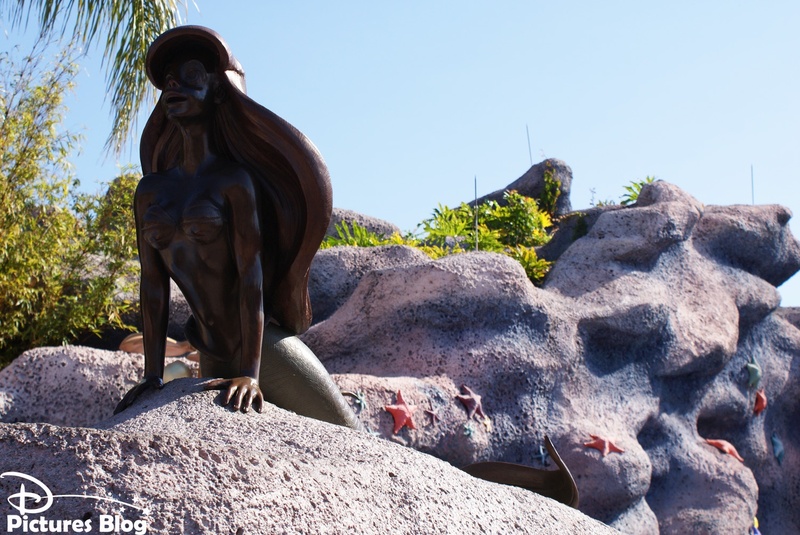 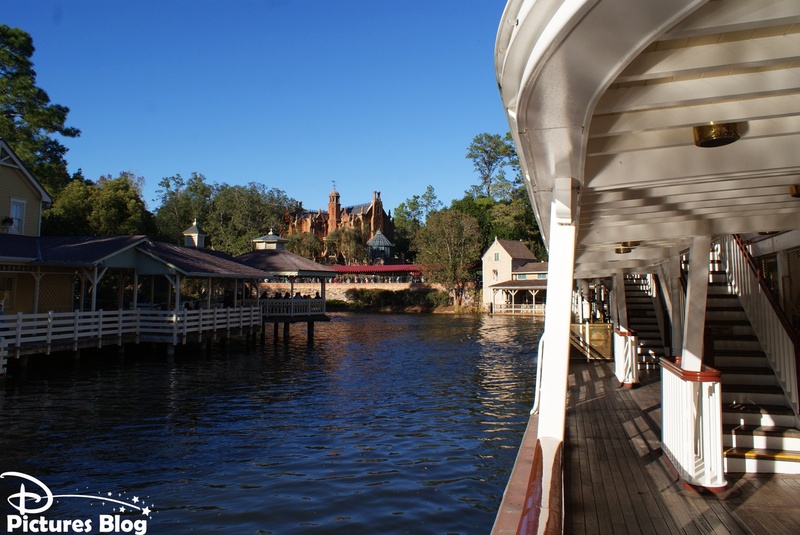 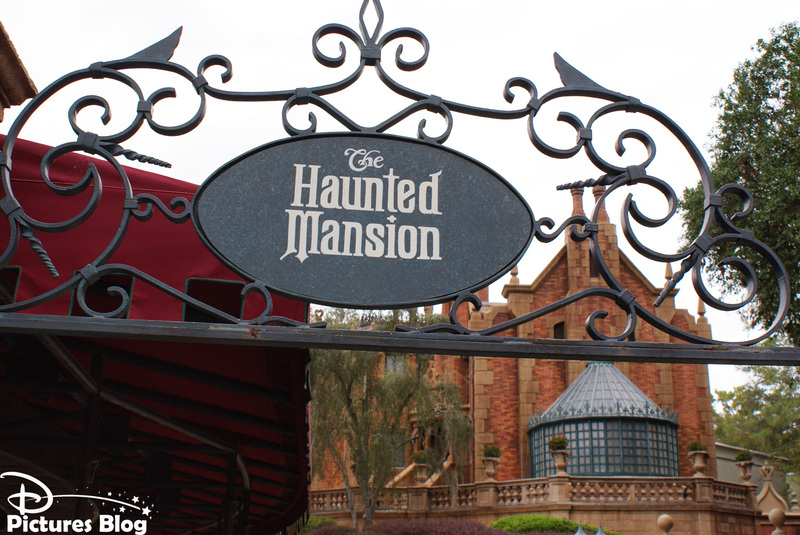 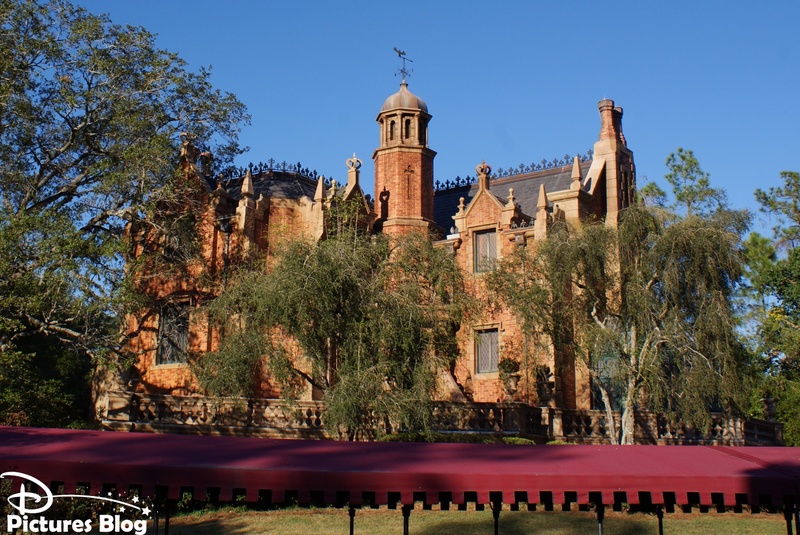 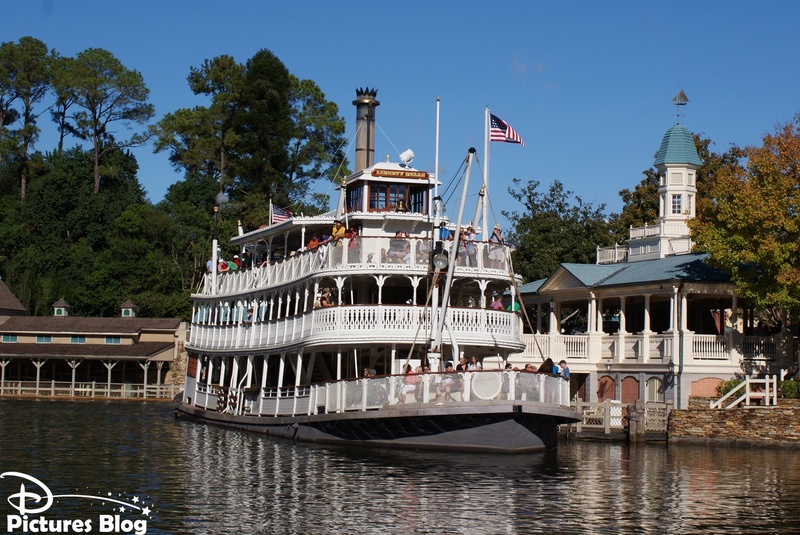 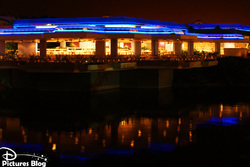 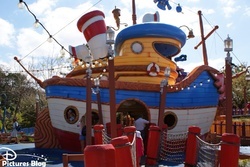 Many restaurants can be found there, as well as three attractions, inclusing the well known Haunted Mansion and the classic Riverboat (featuring the Liberty Belle boat). 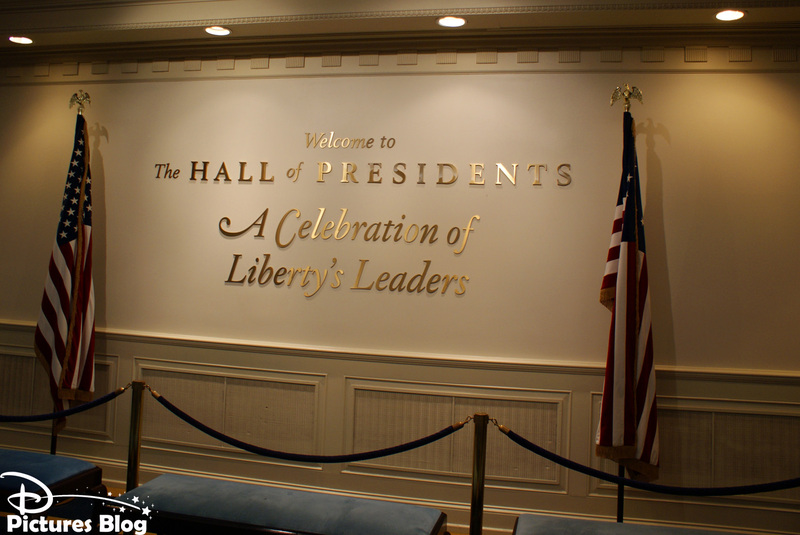 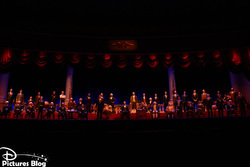 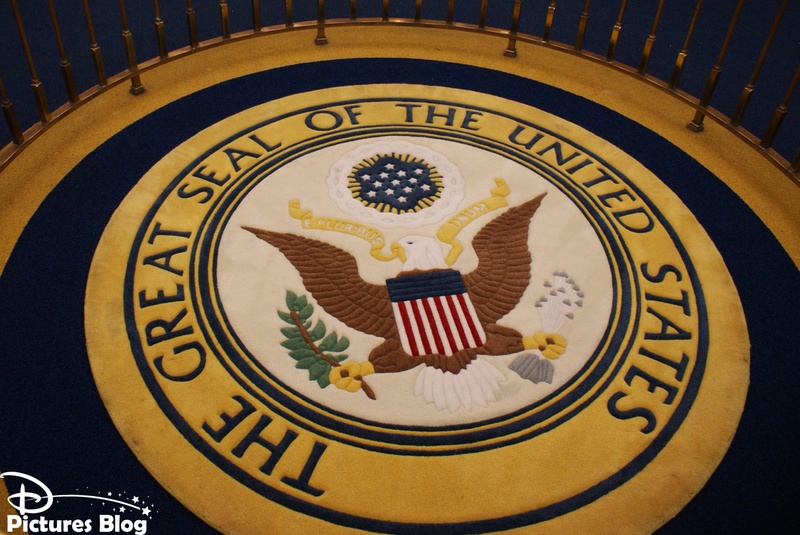 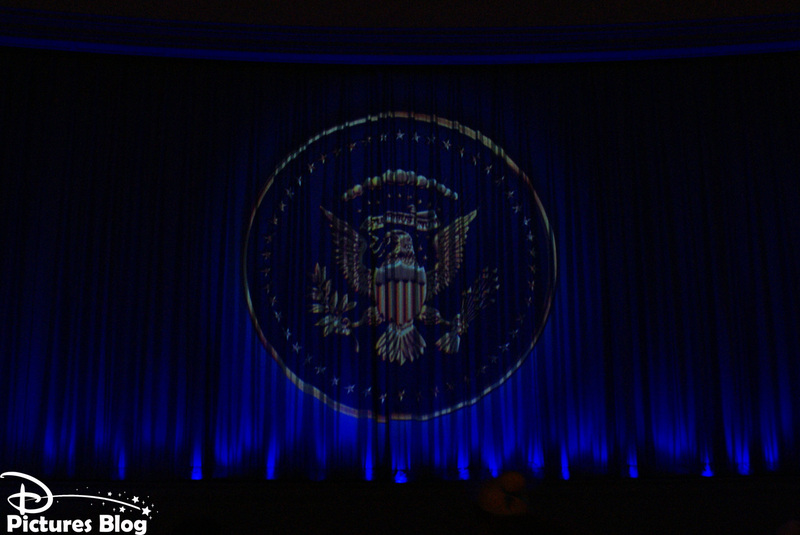 The Hall Of Presidents, featuring all 43 Presidents of the United States, gives his soul to this Land, through a unique audio-animatronic show.